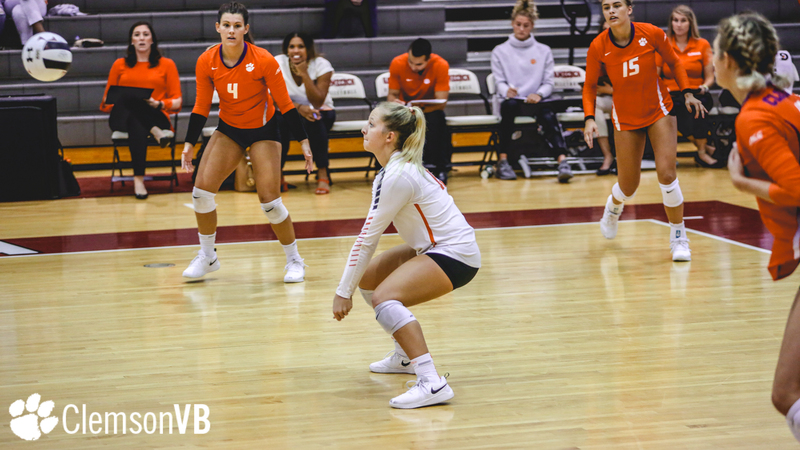 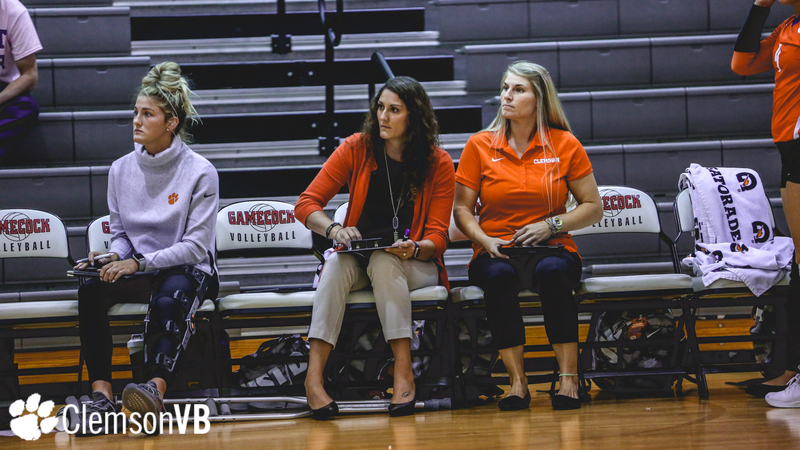 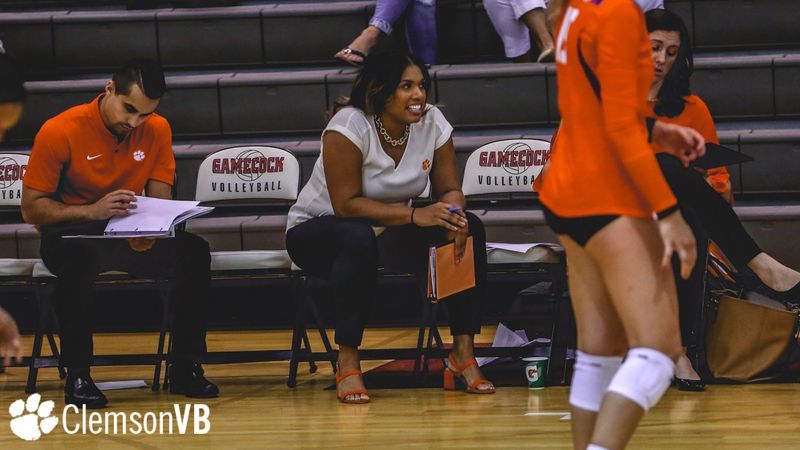 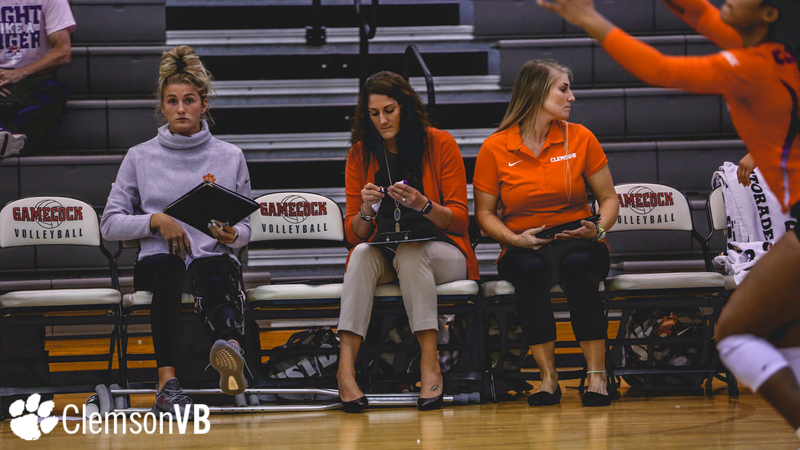 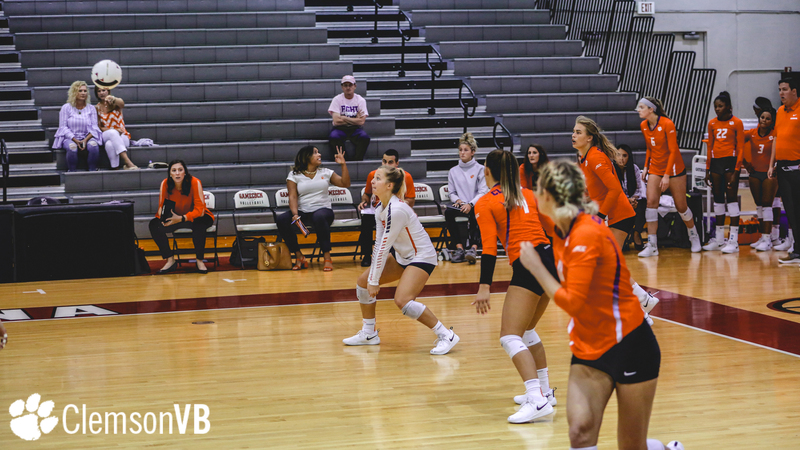 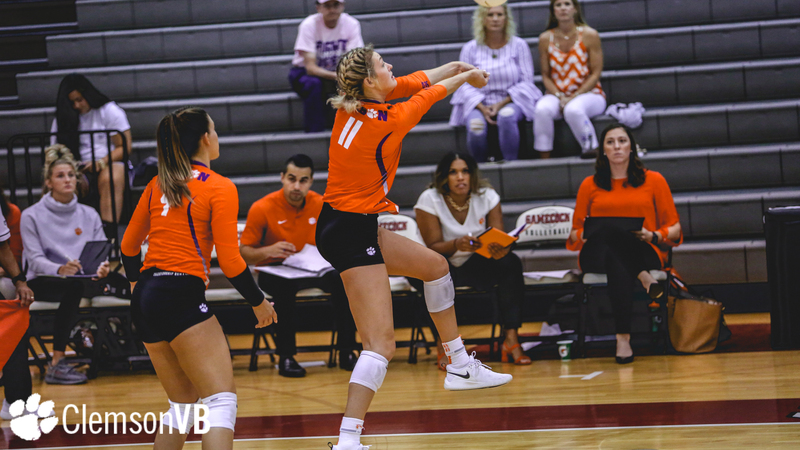 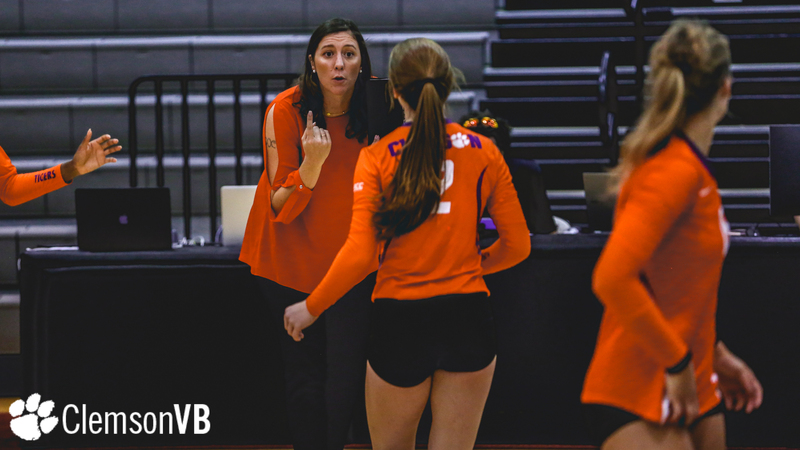 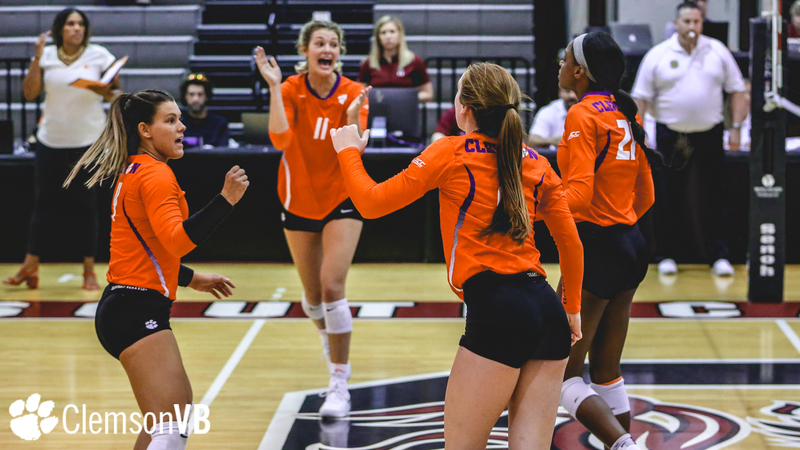 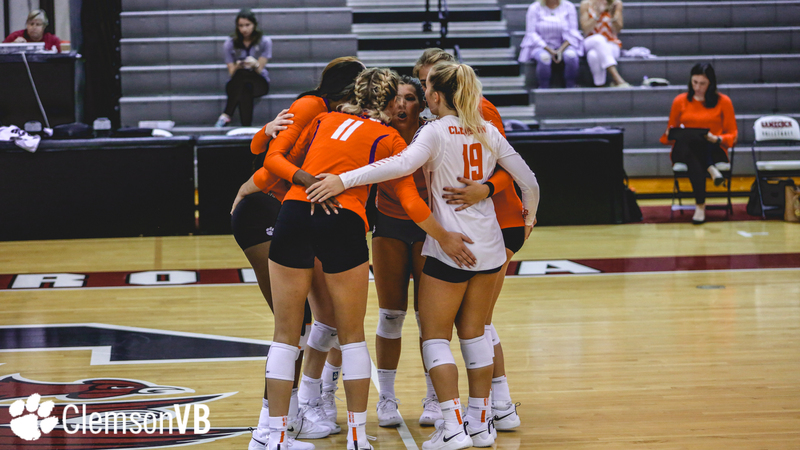 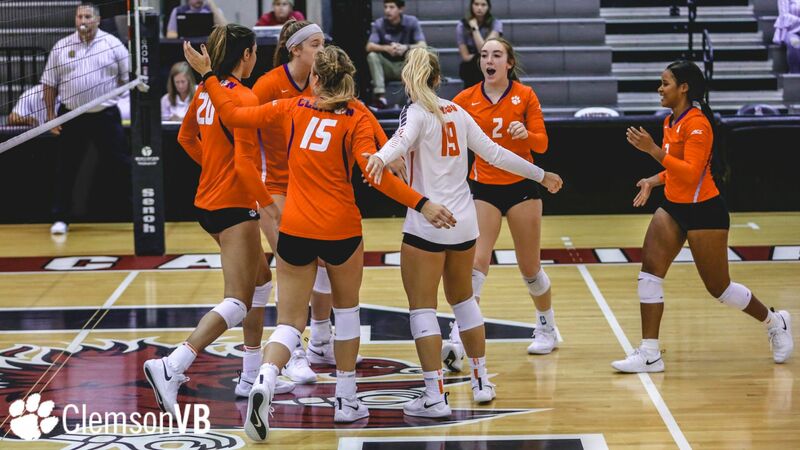 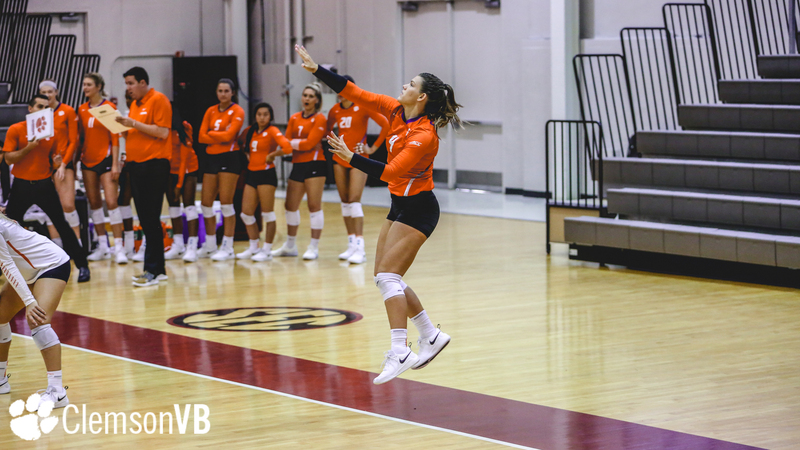 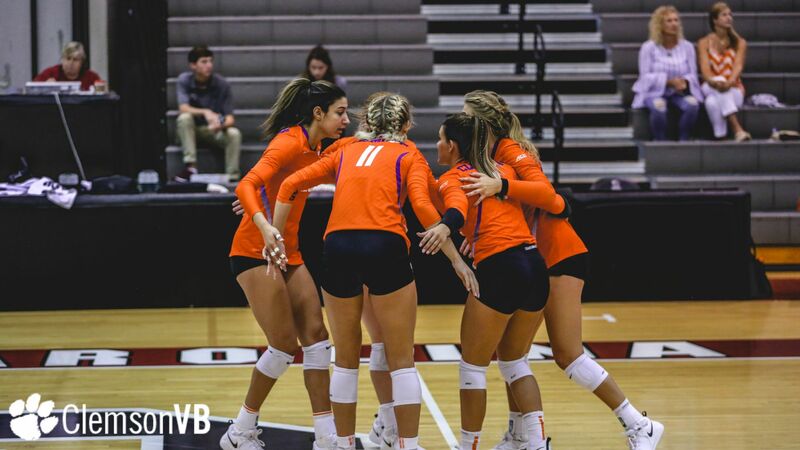 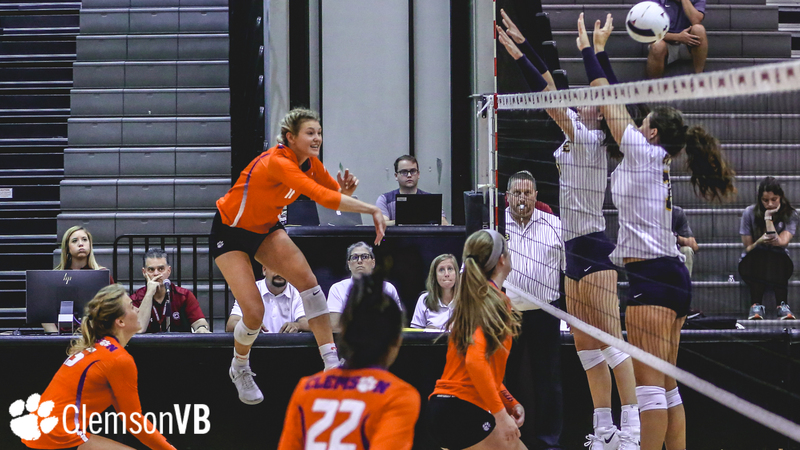 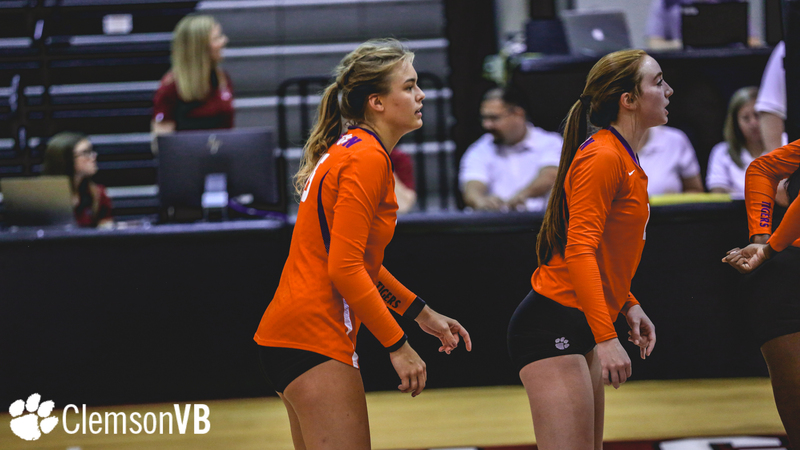 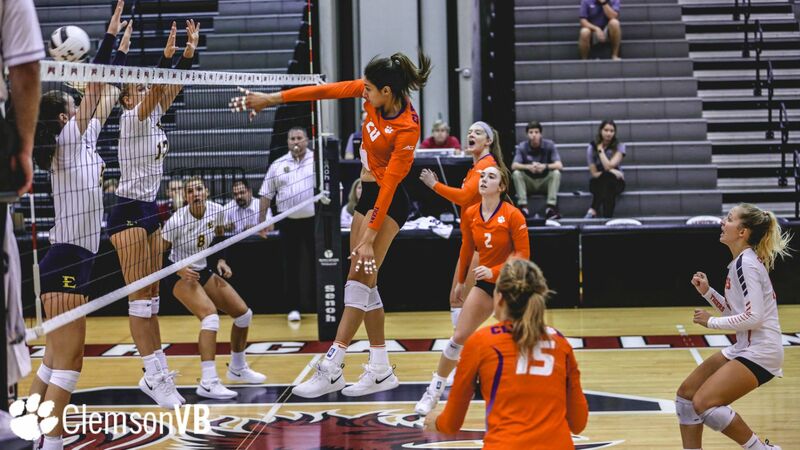 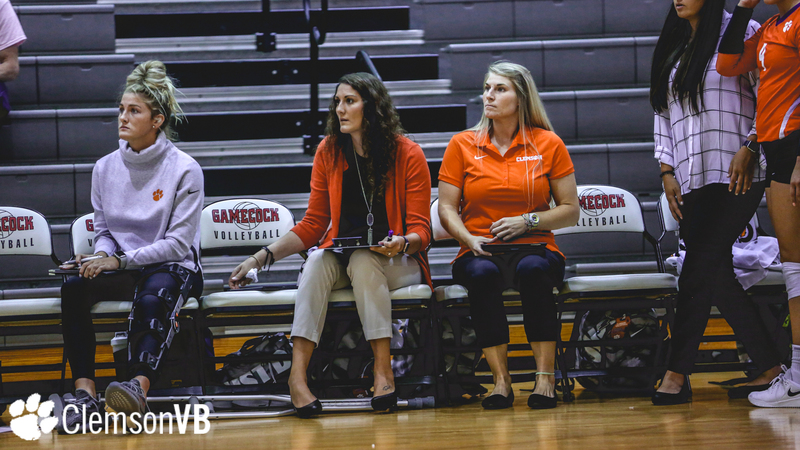 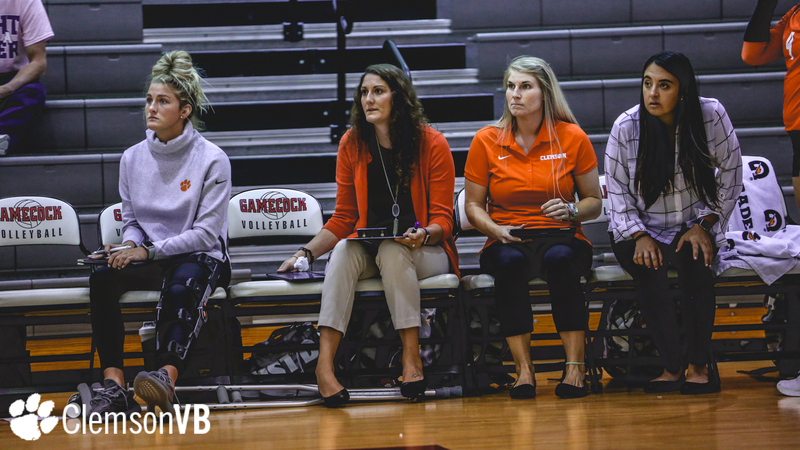 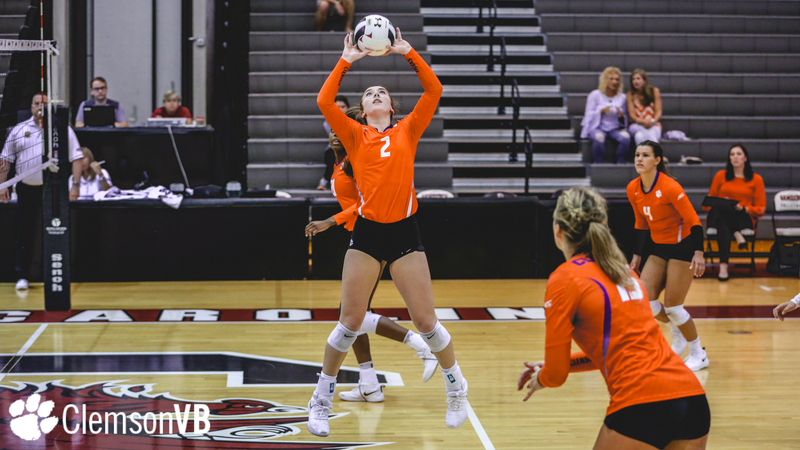 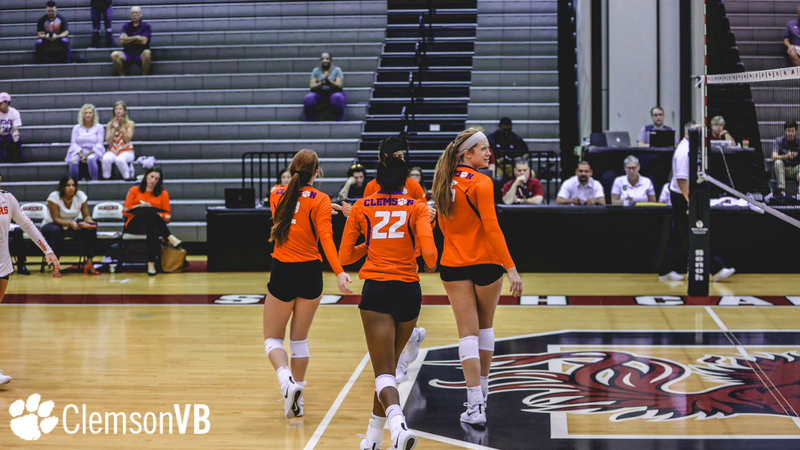 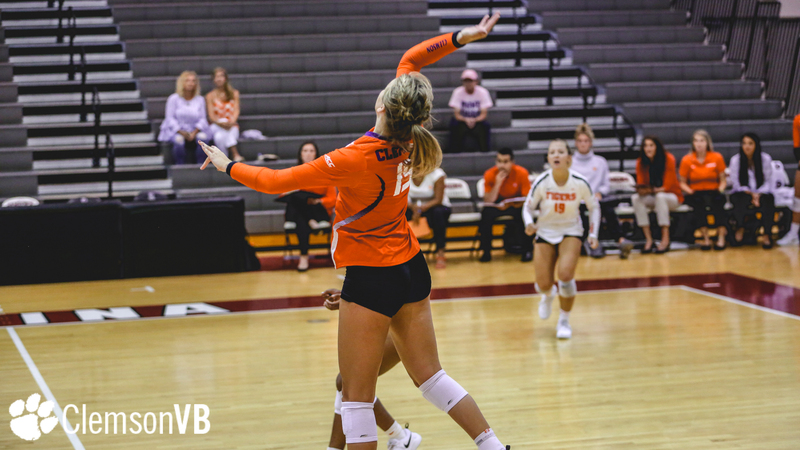 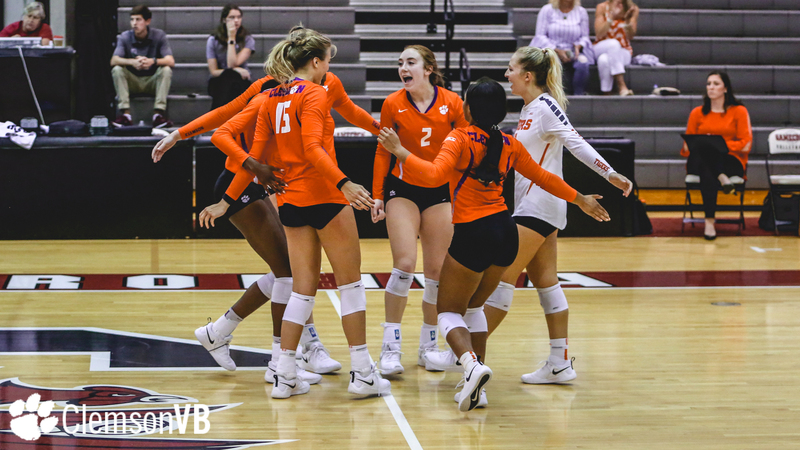 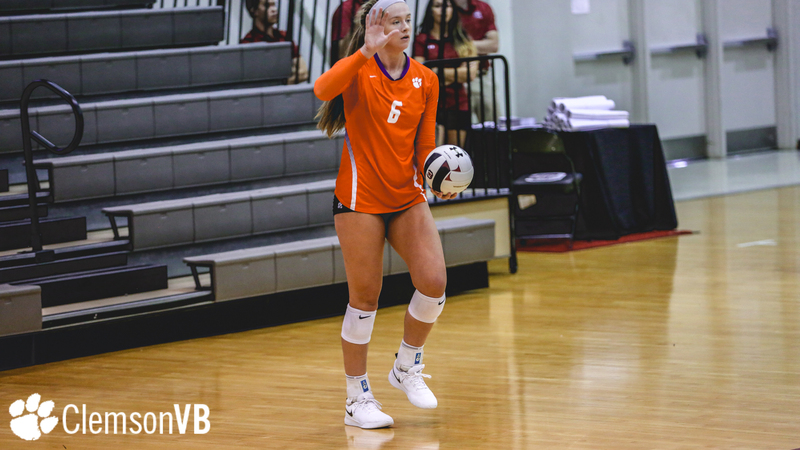 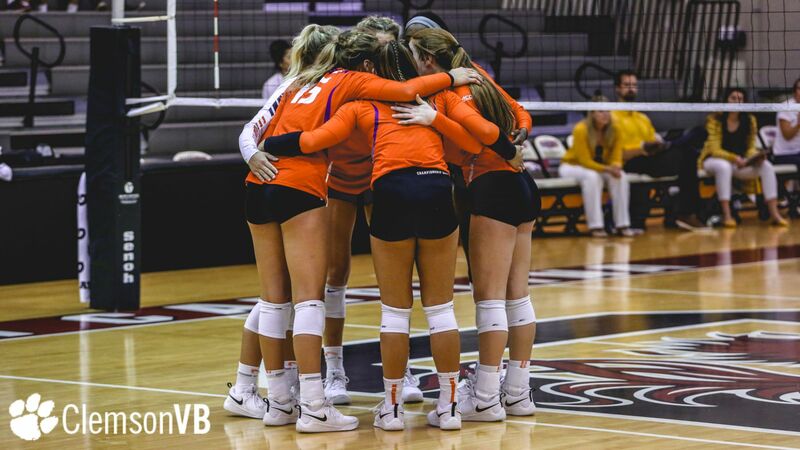 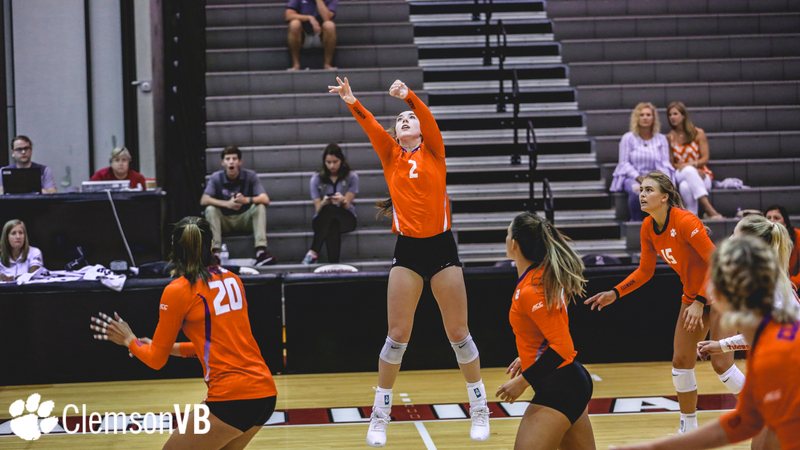 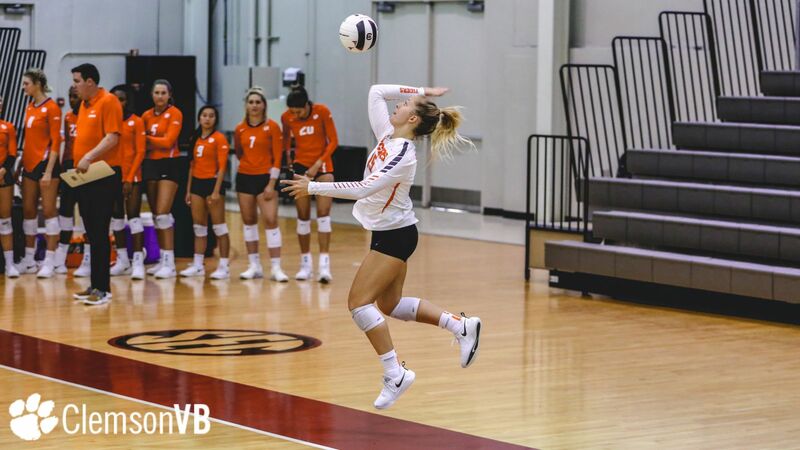 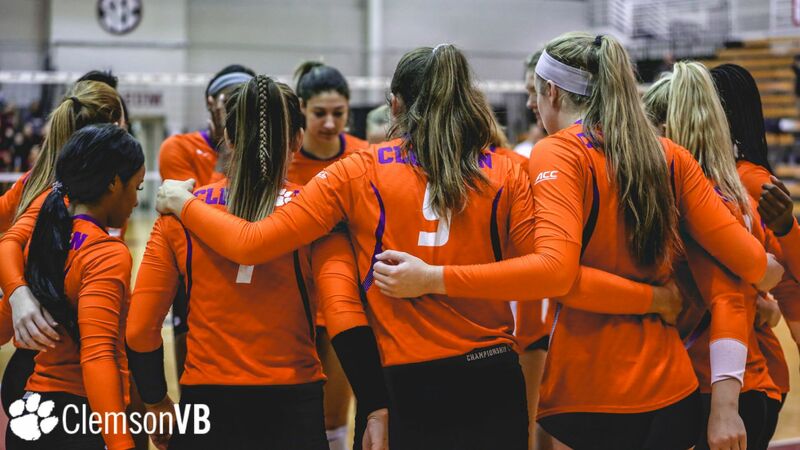 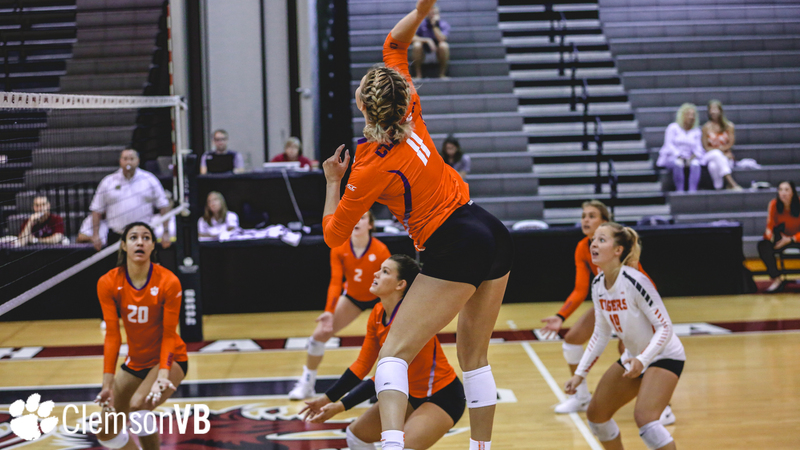 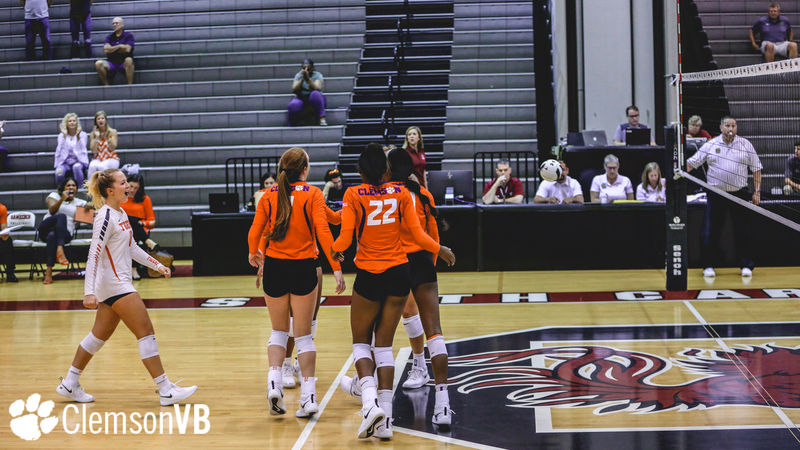 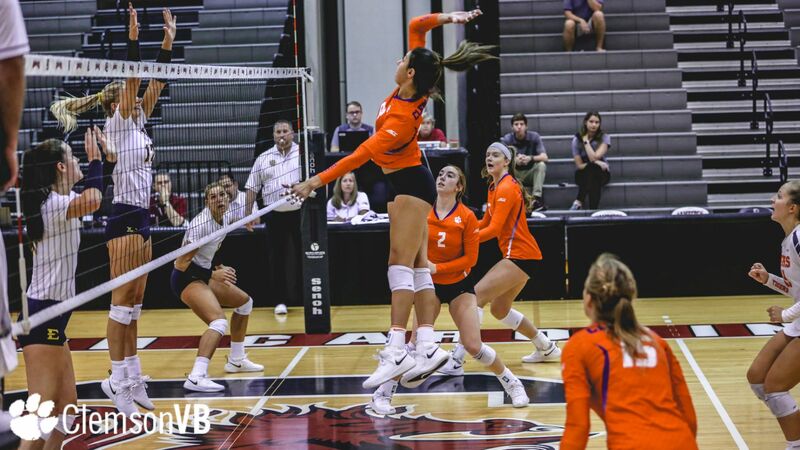 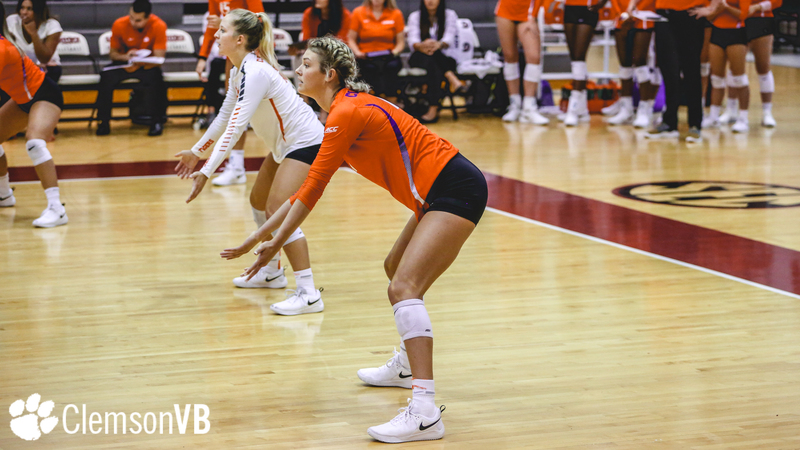 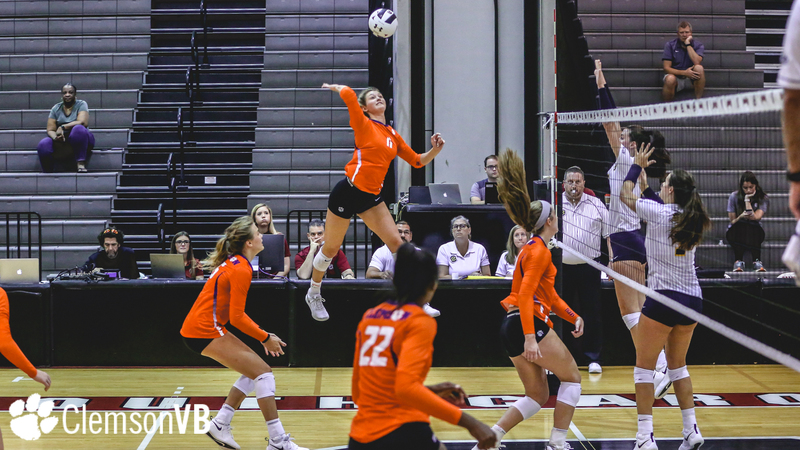 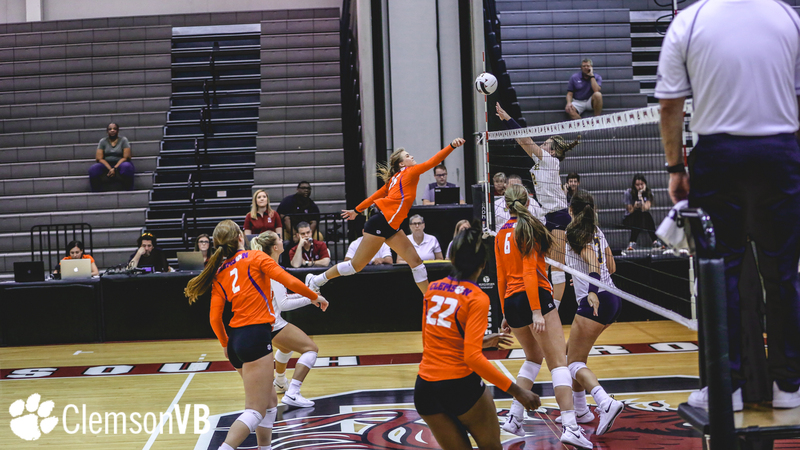 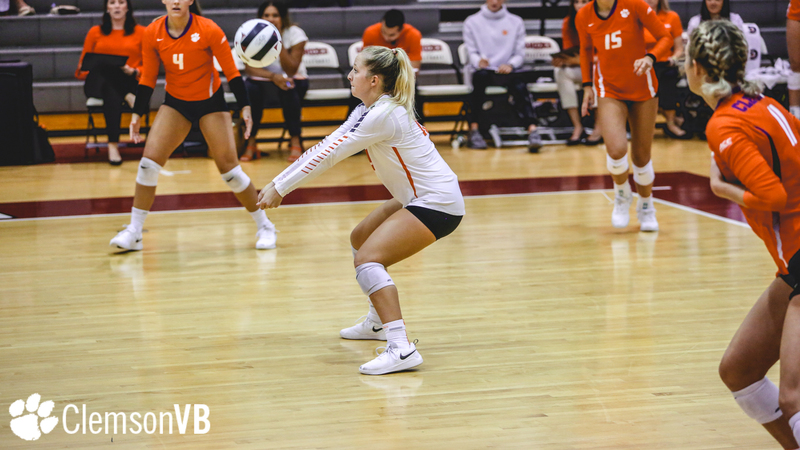 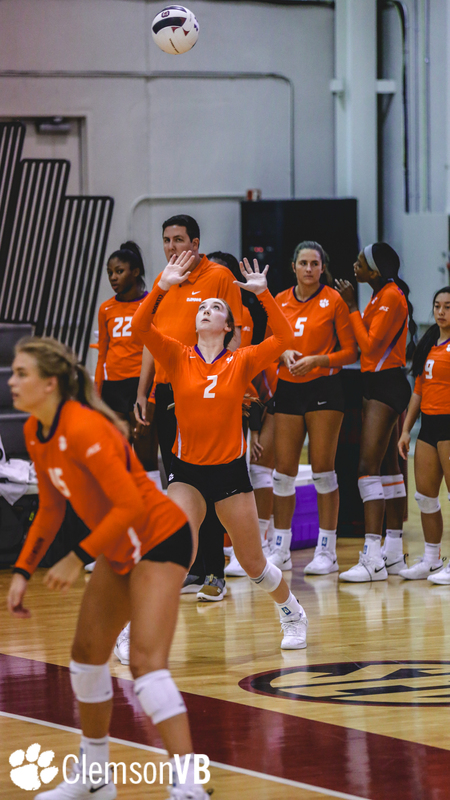 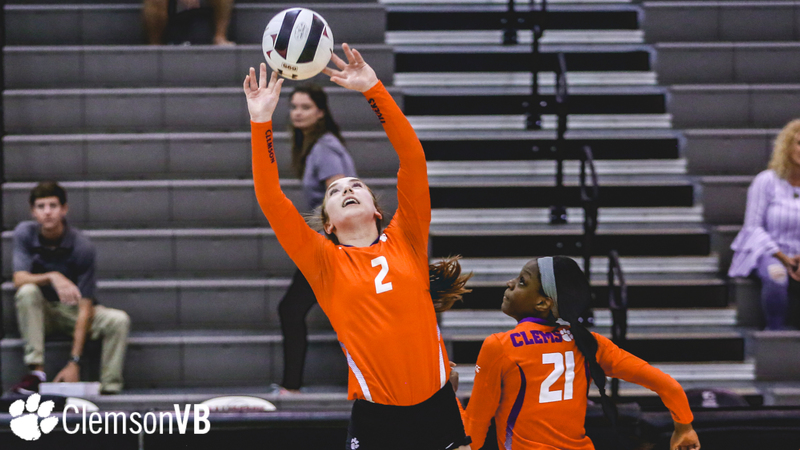 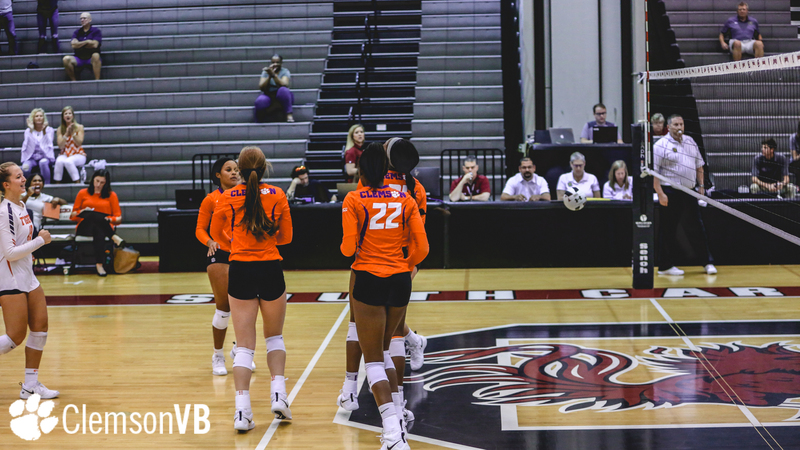 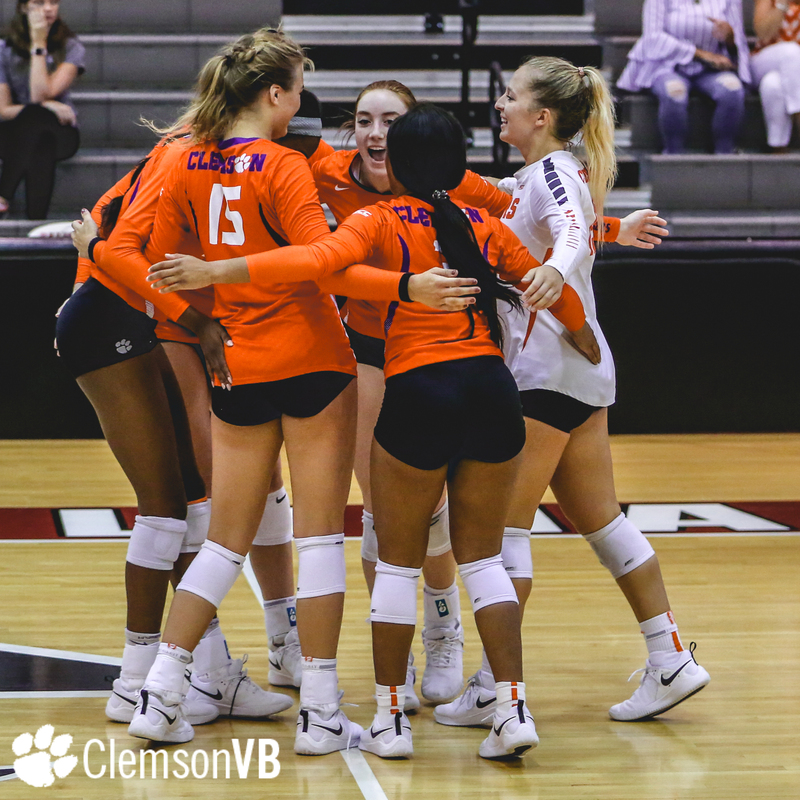 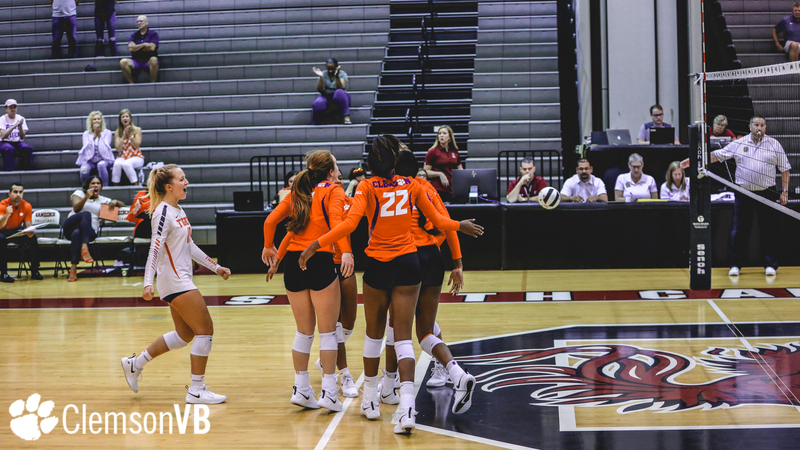 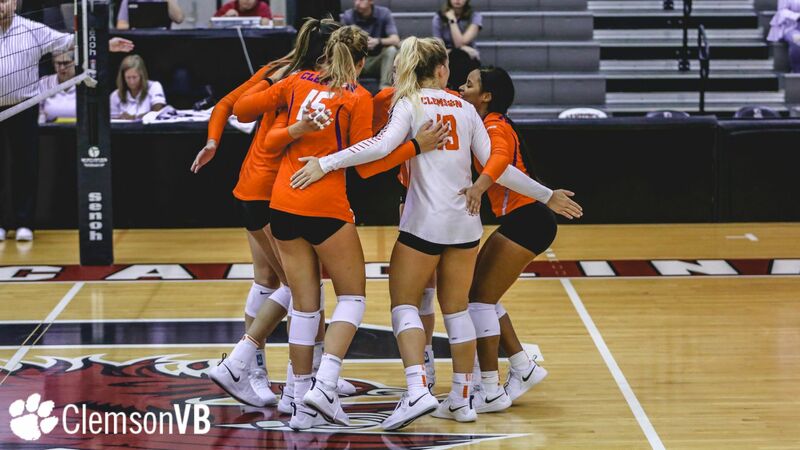 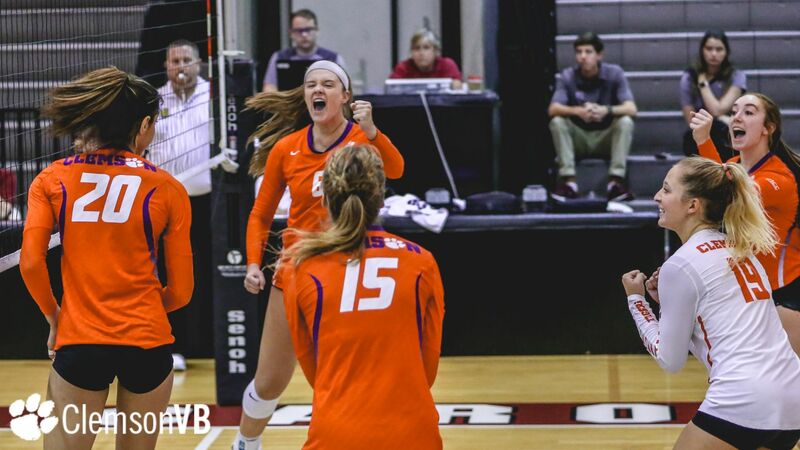 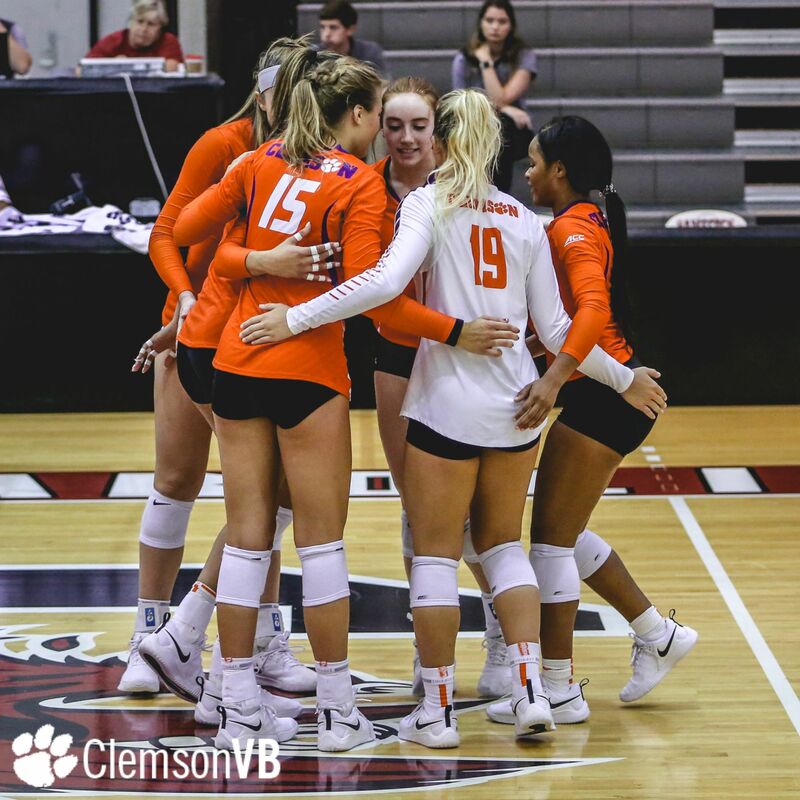 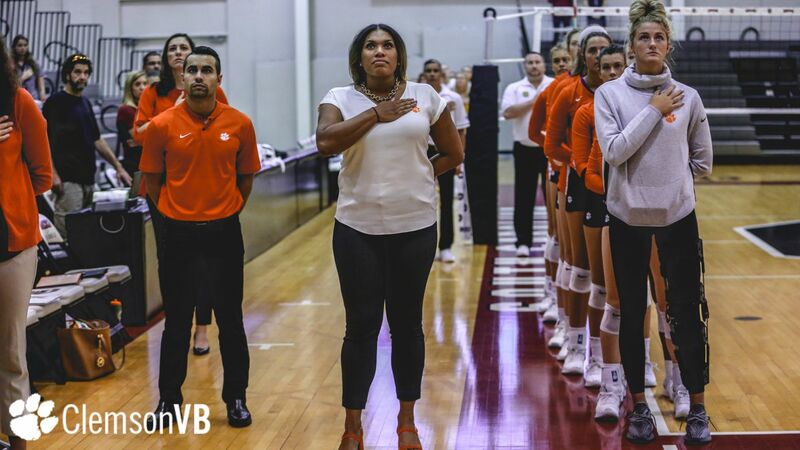 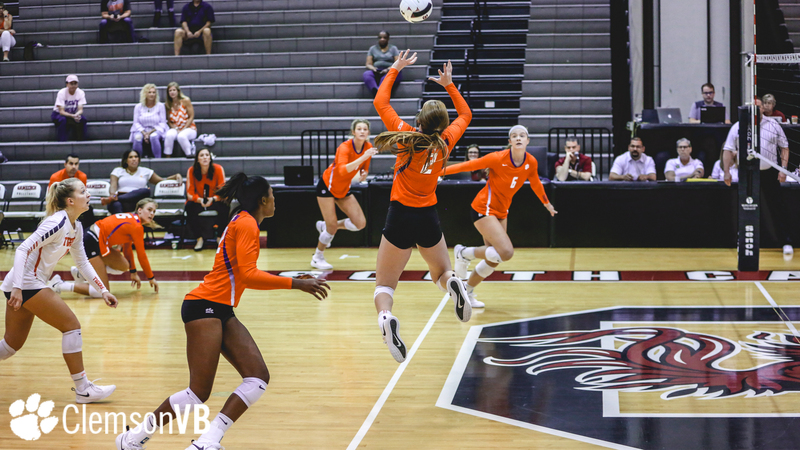 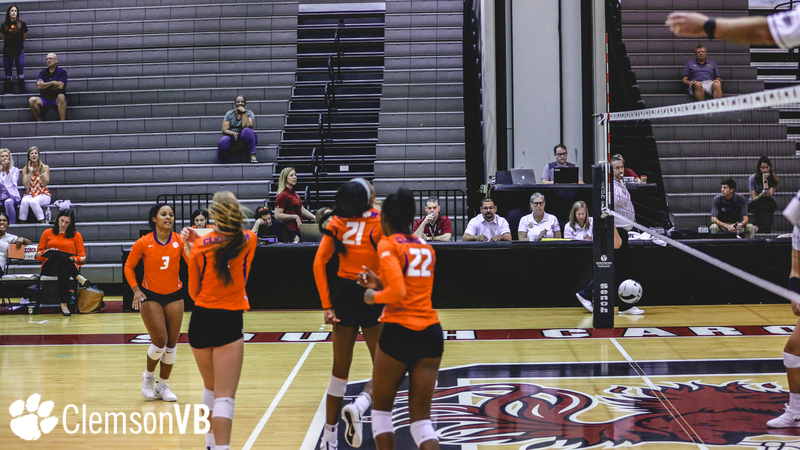 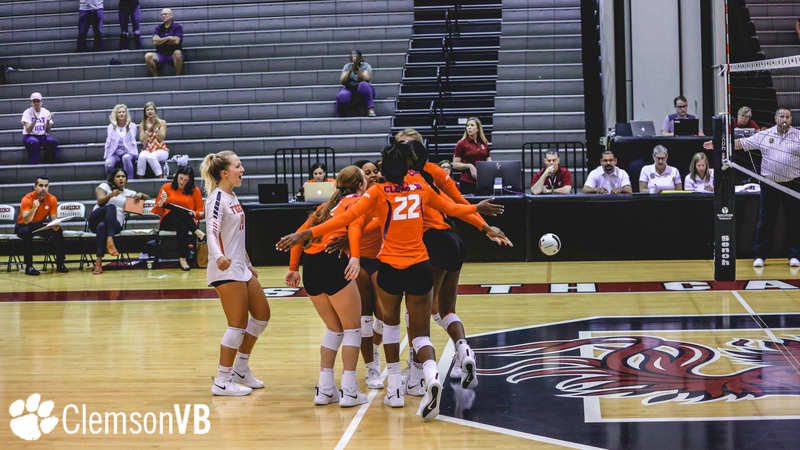 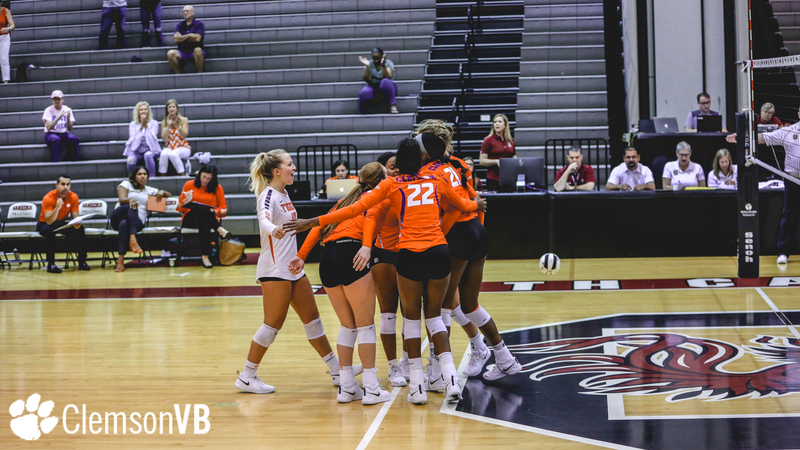 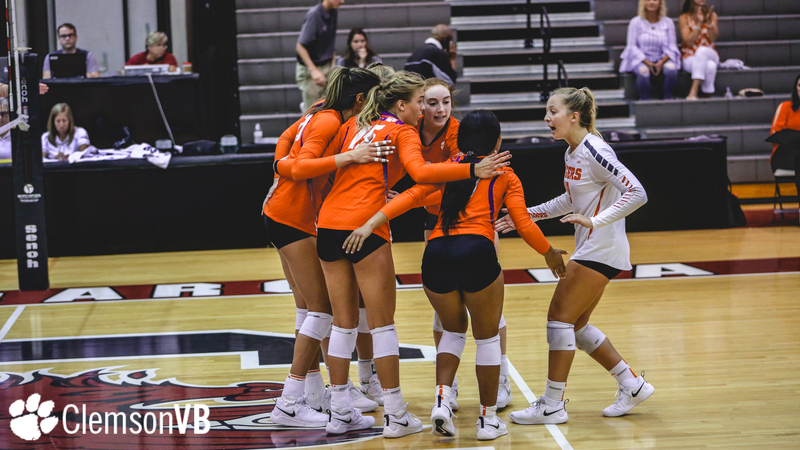 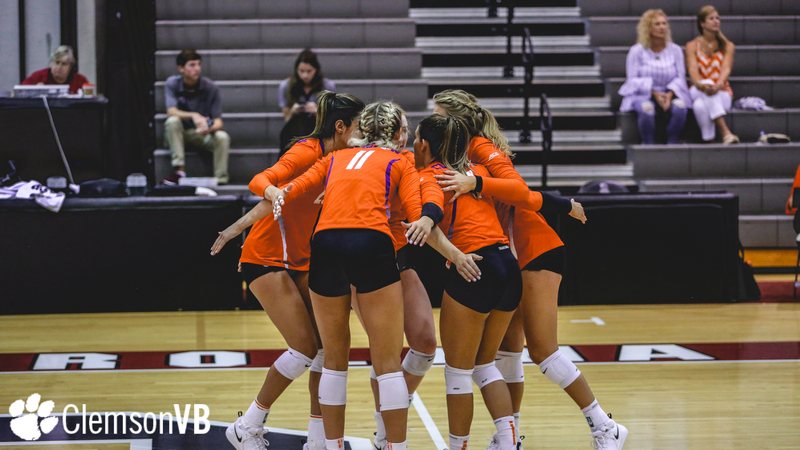 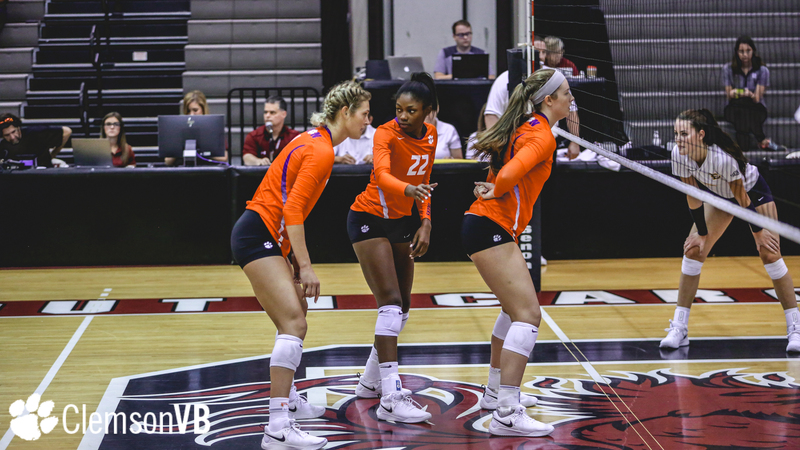 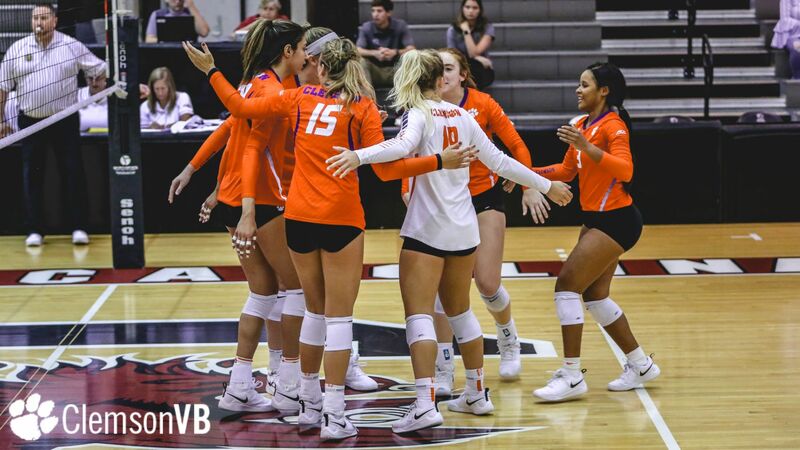 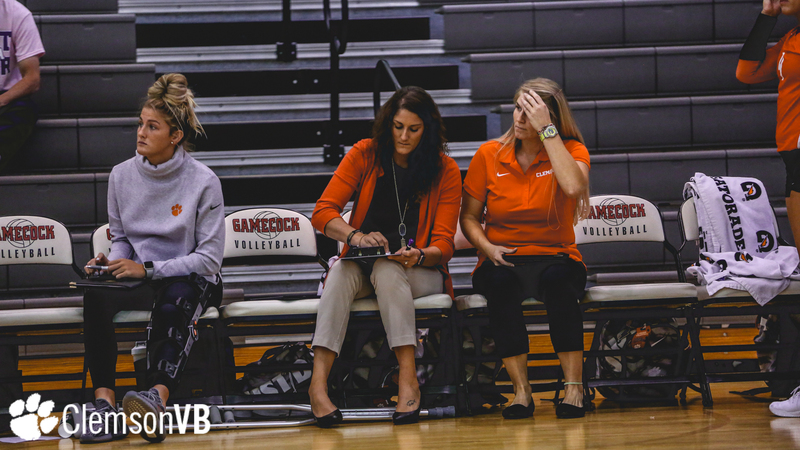 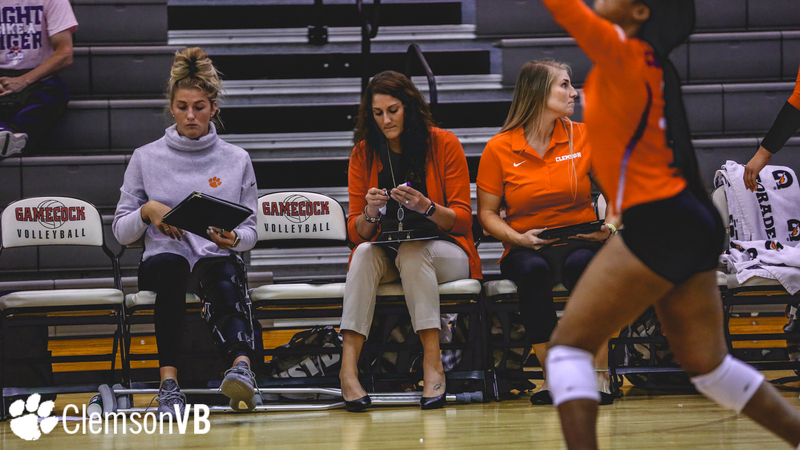 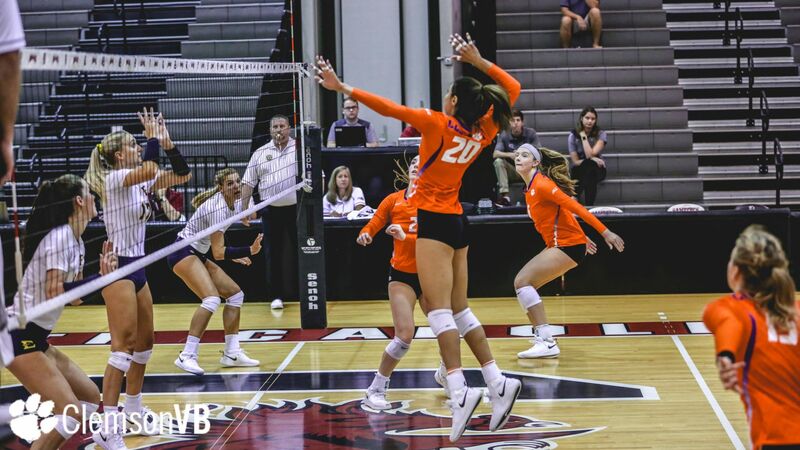 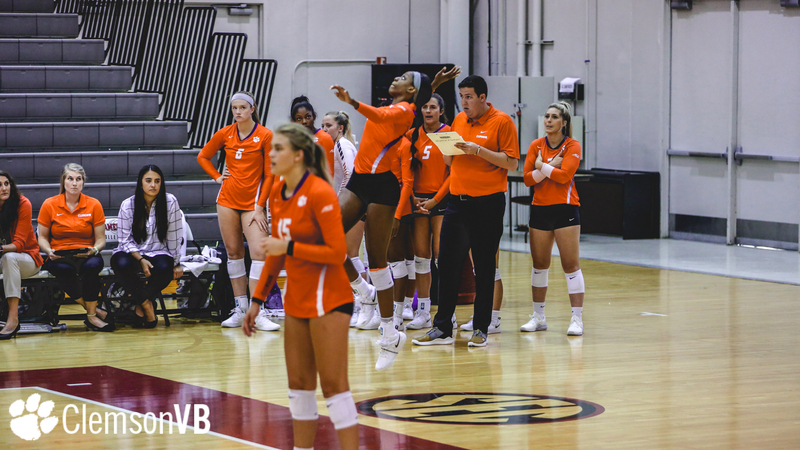 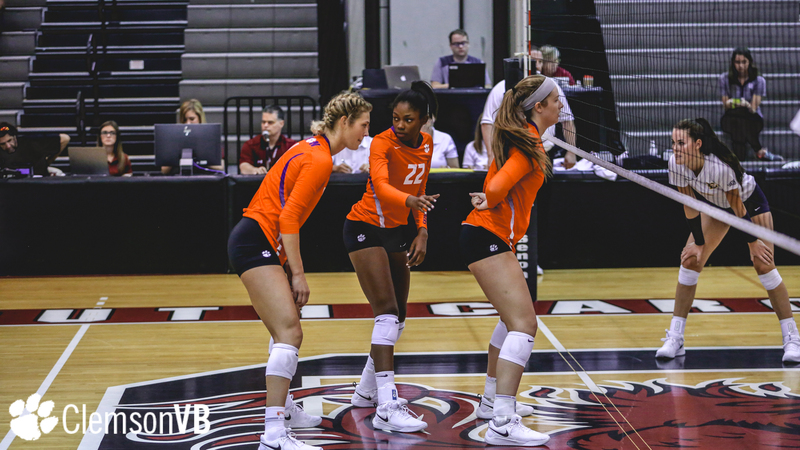 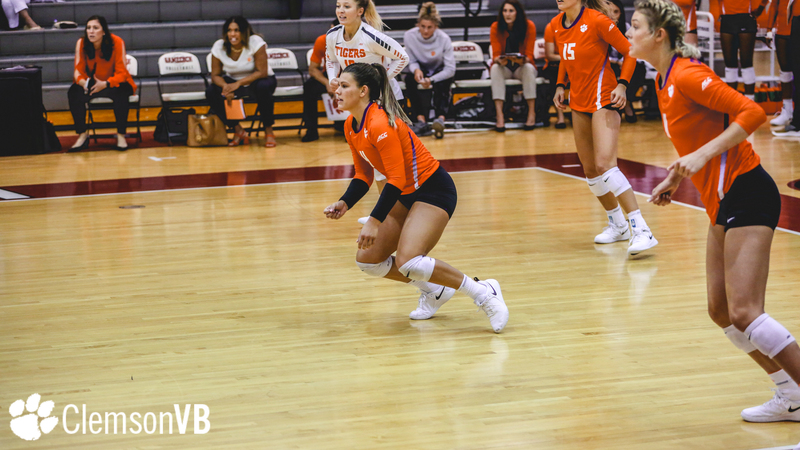 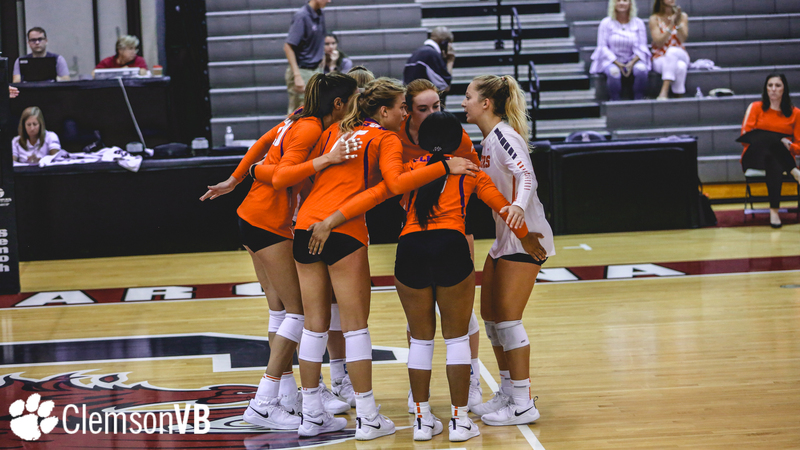 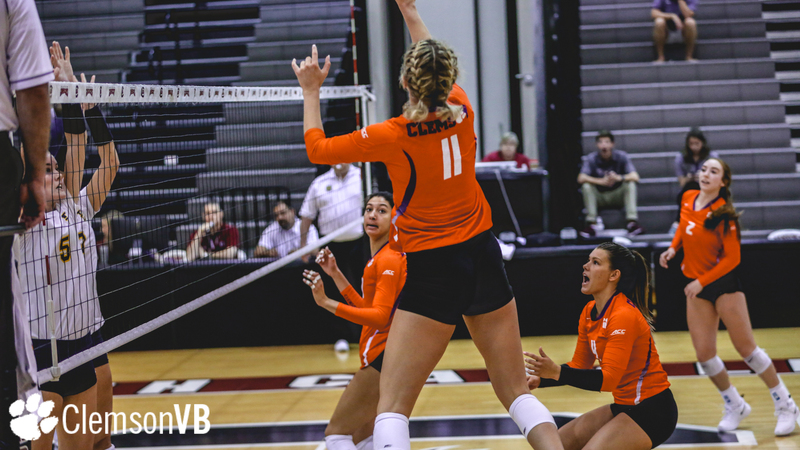 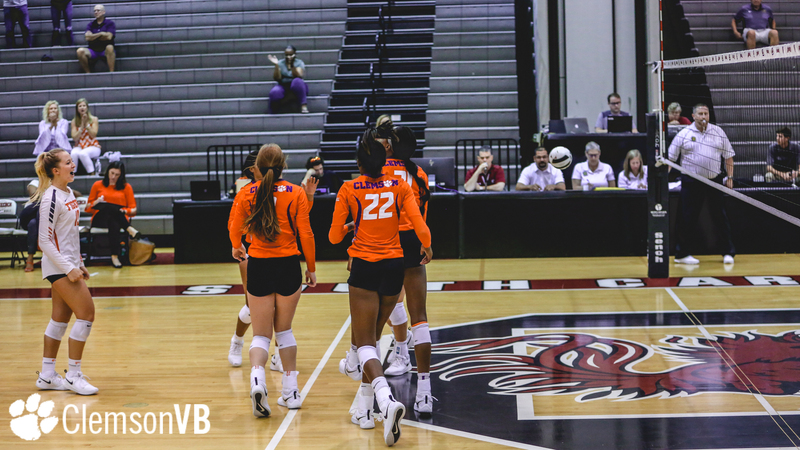 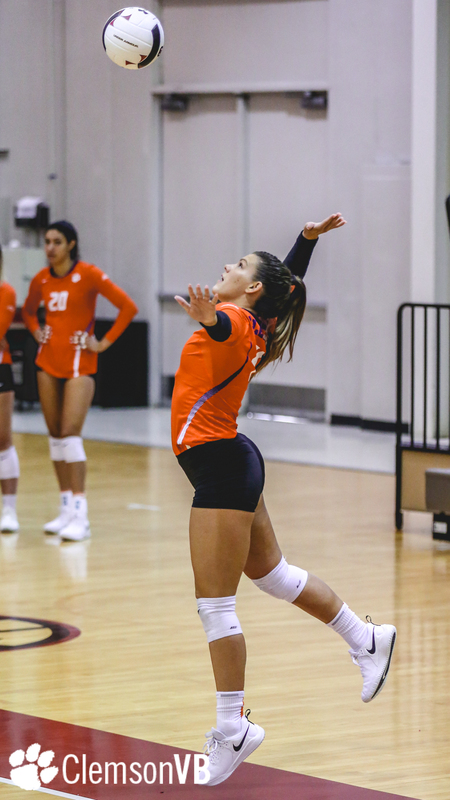 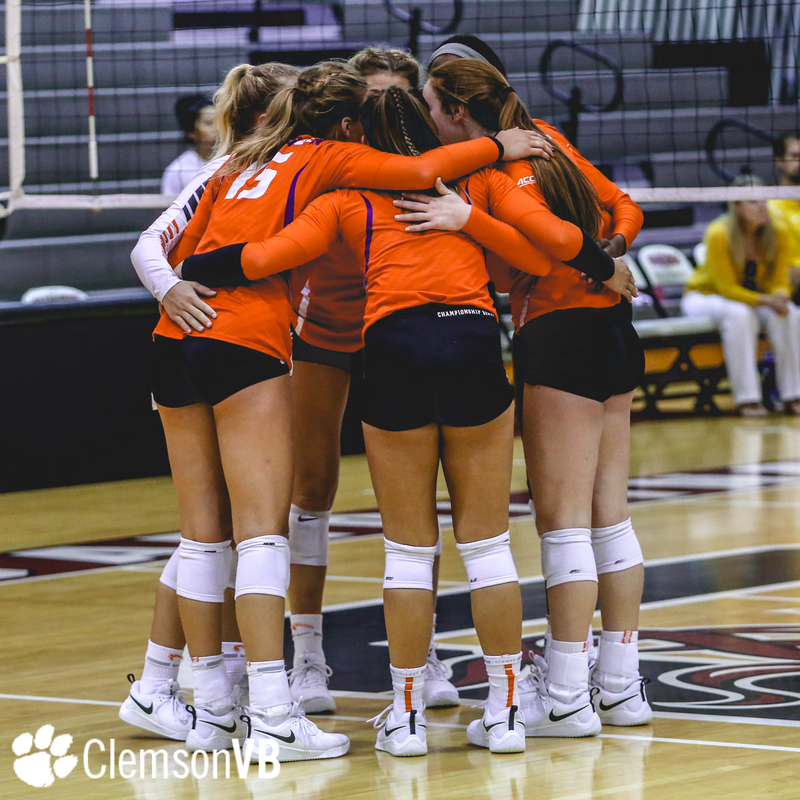 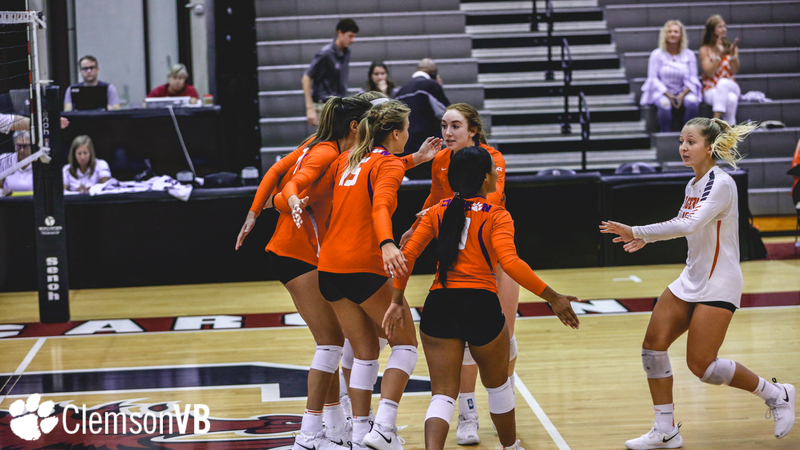 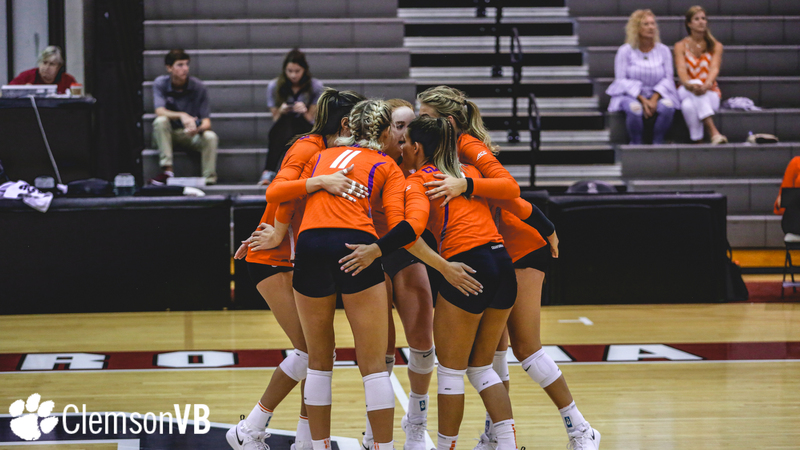 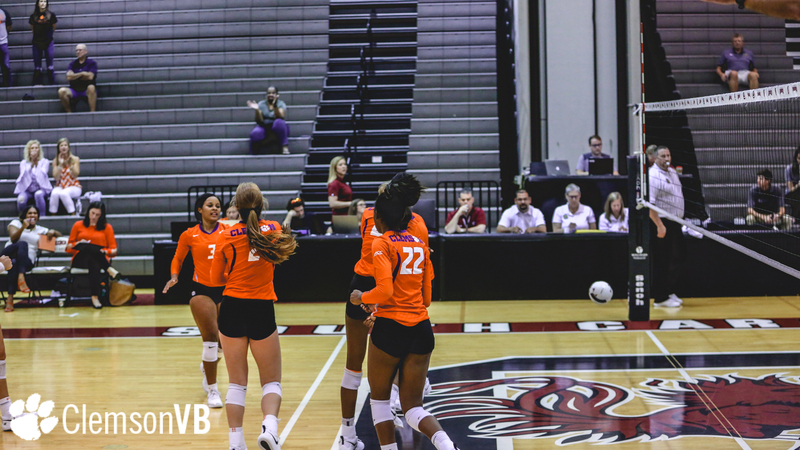 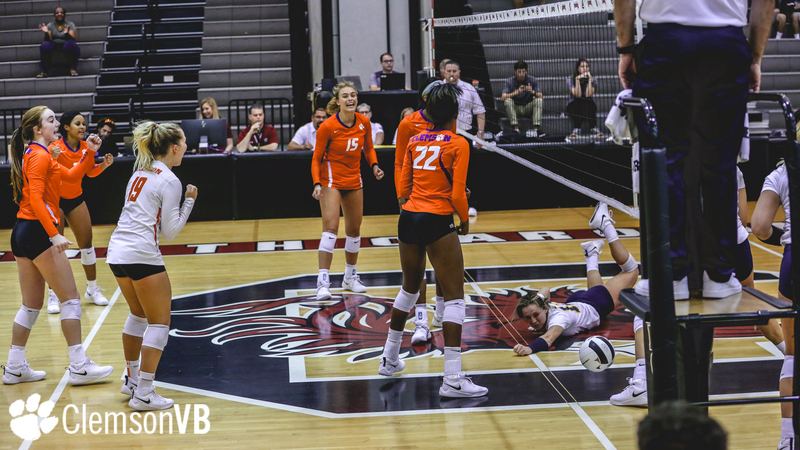 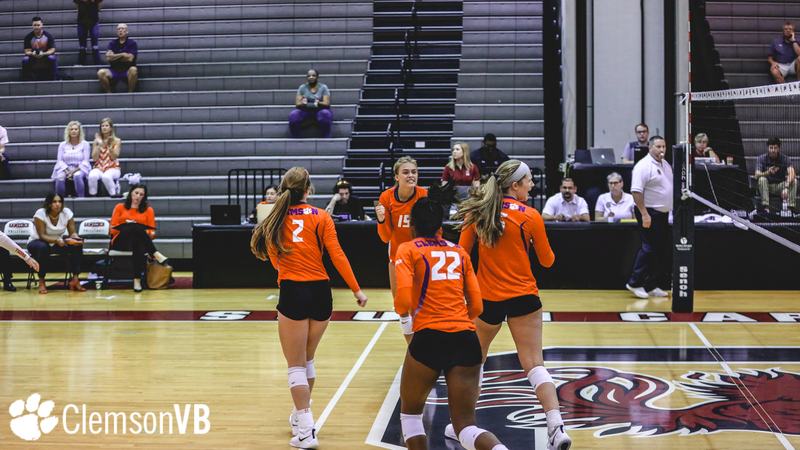 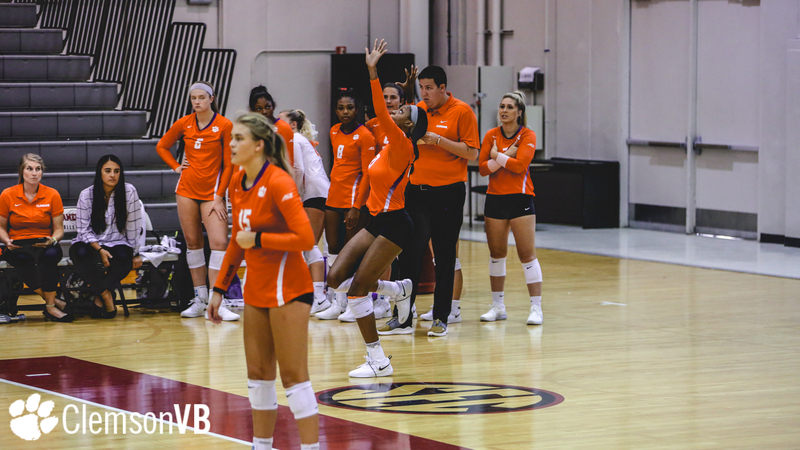 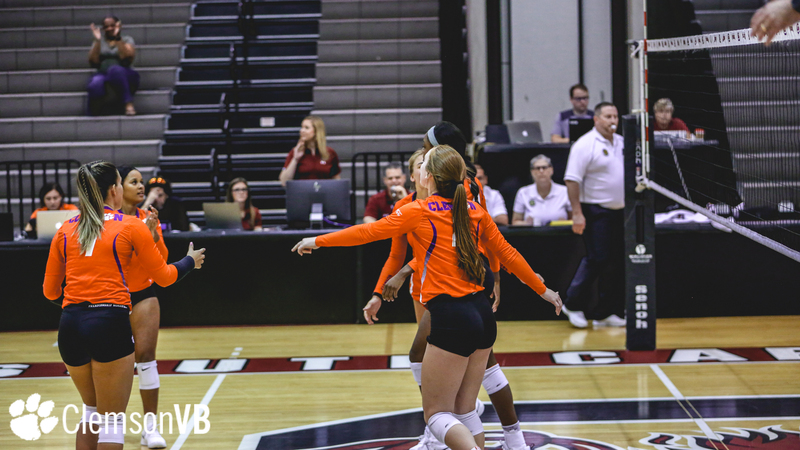 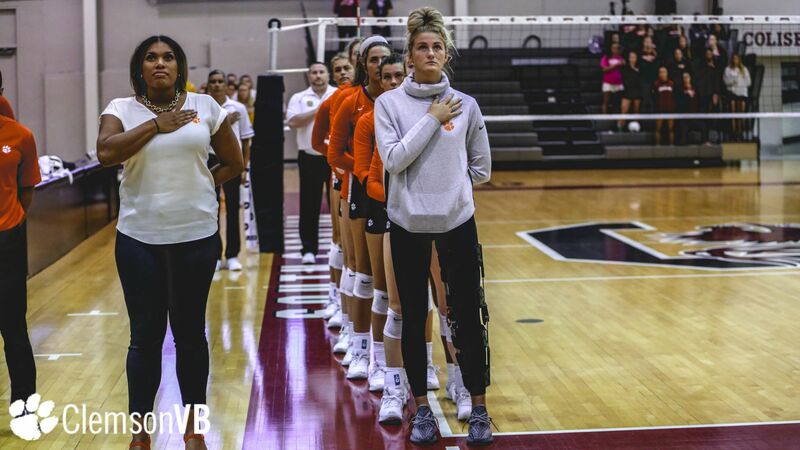 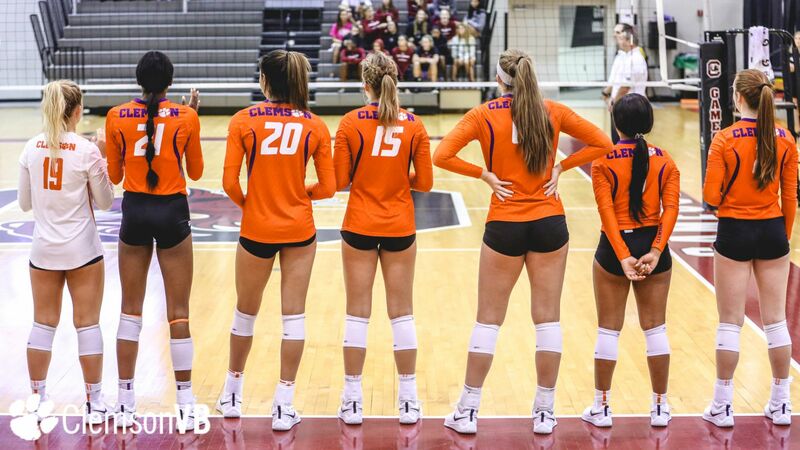 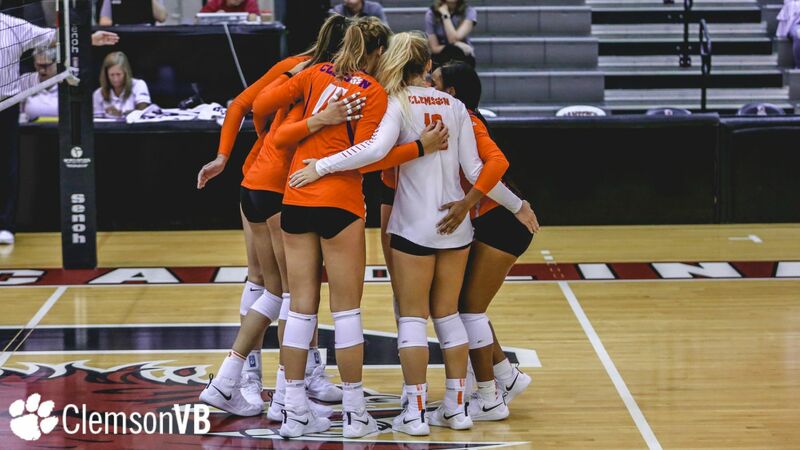 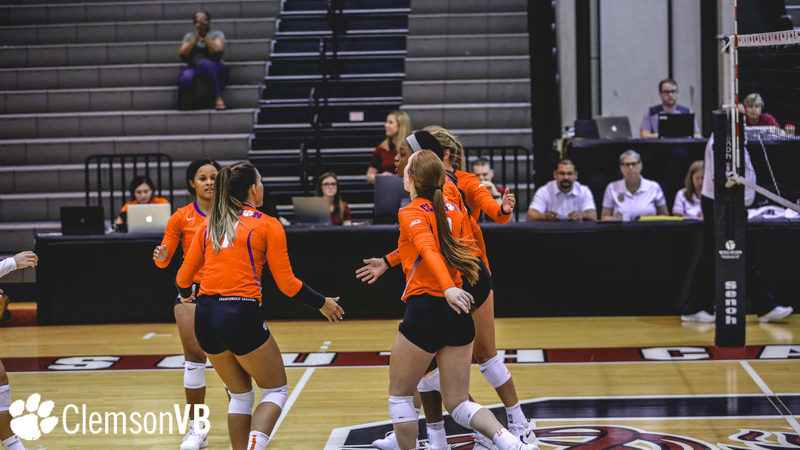 COLUMBIA, S.C. – The Clemson volleyball team split its pair of opening matches at South Carolina’s Gamecock Invitational Friday, which was highlighted by a sweep (25-15, 25-13, 25-15) over Texas A&M Corpus Christi. 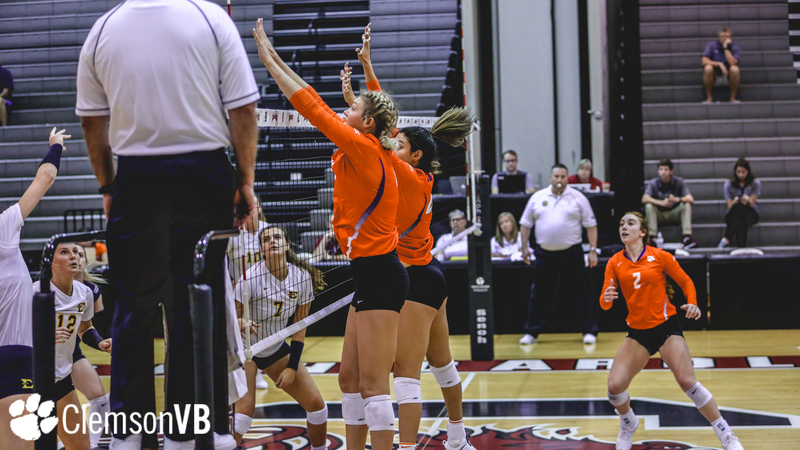 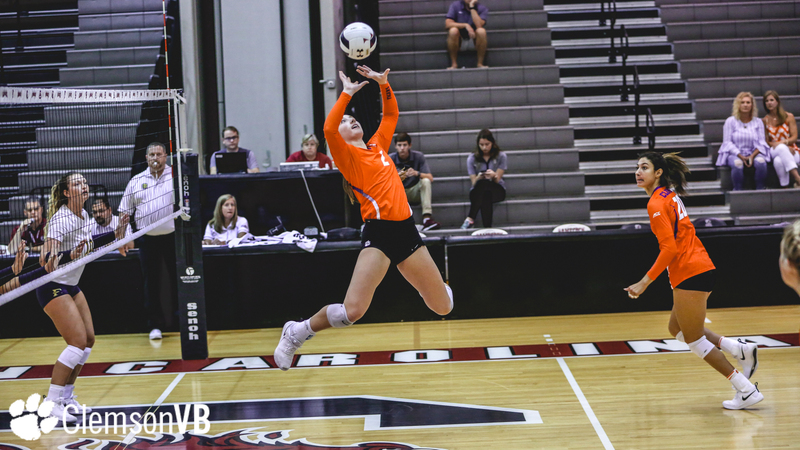 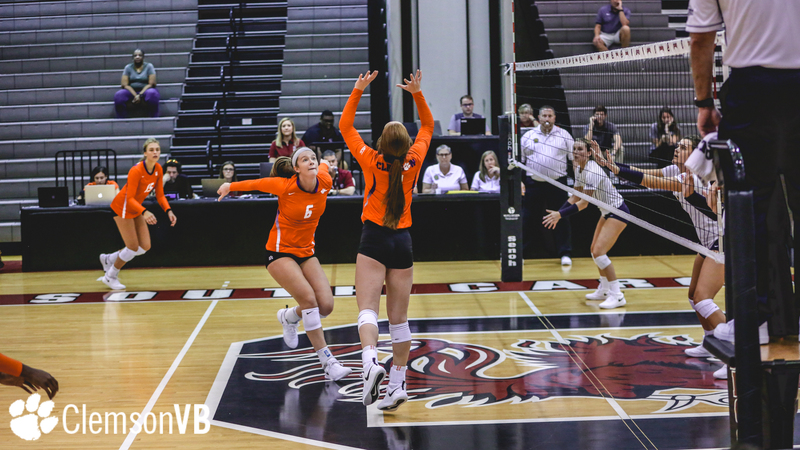 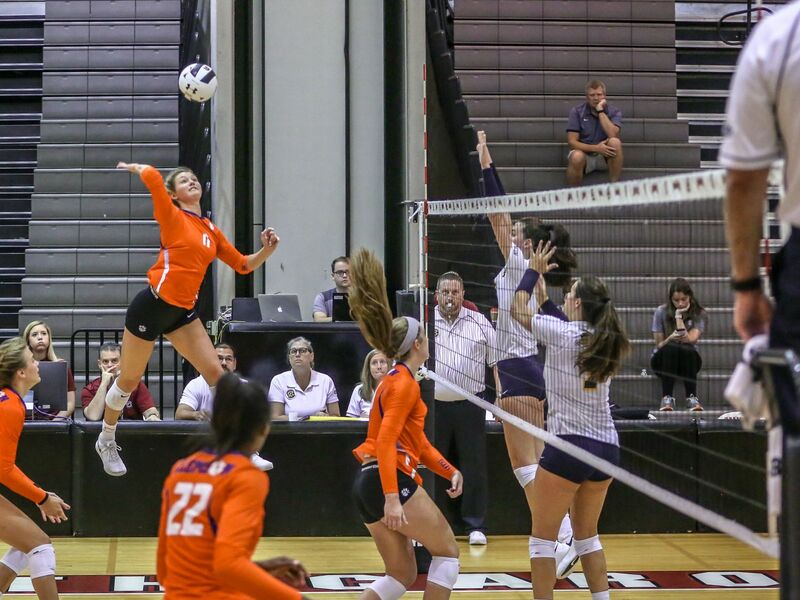 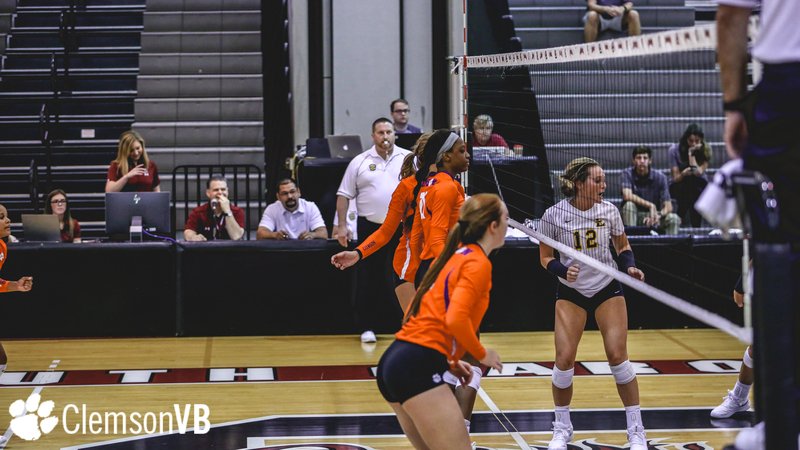 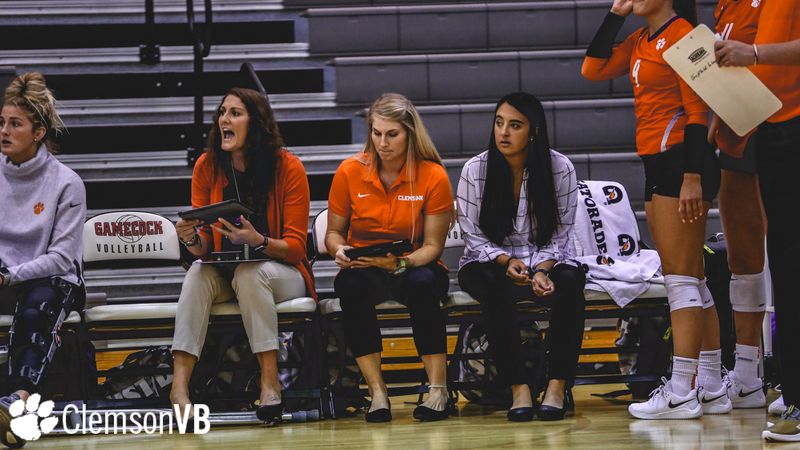 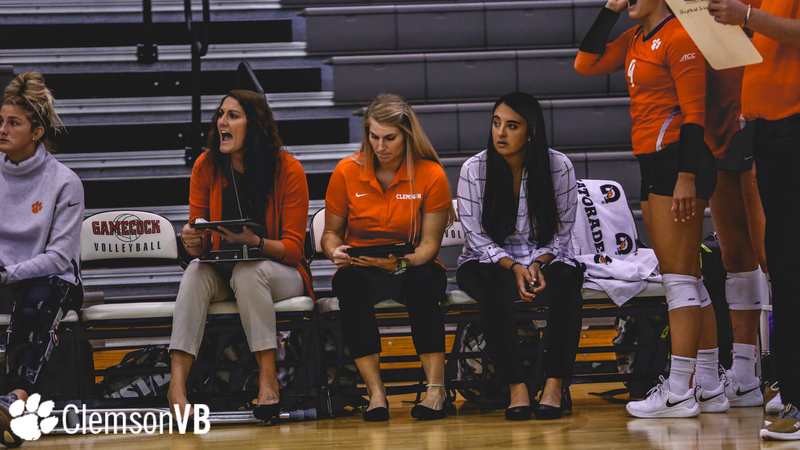 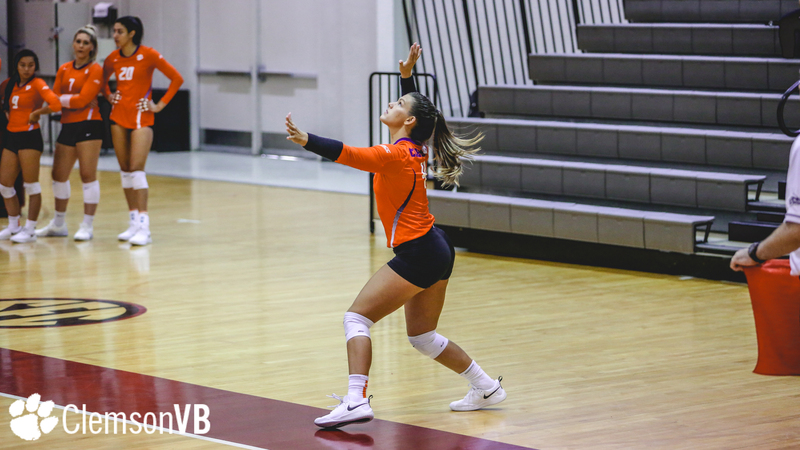 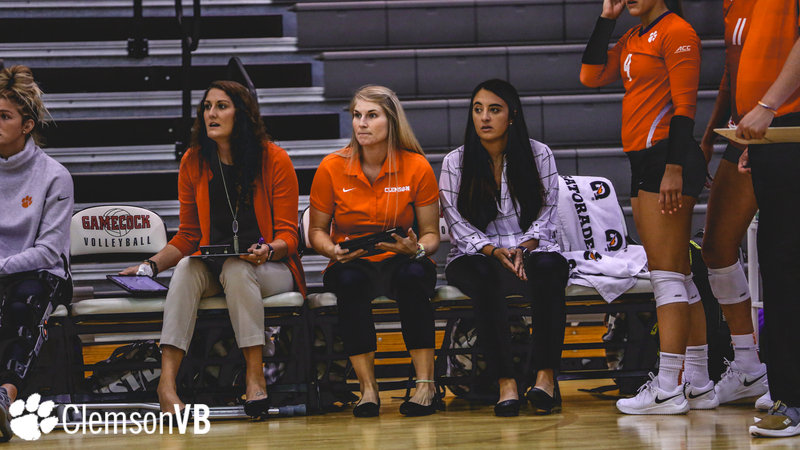 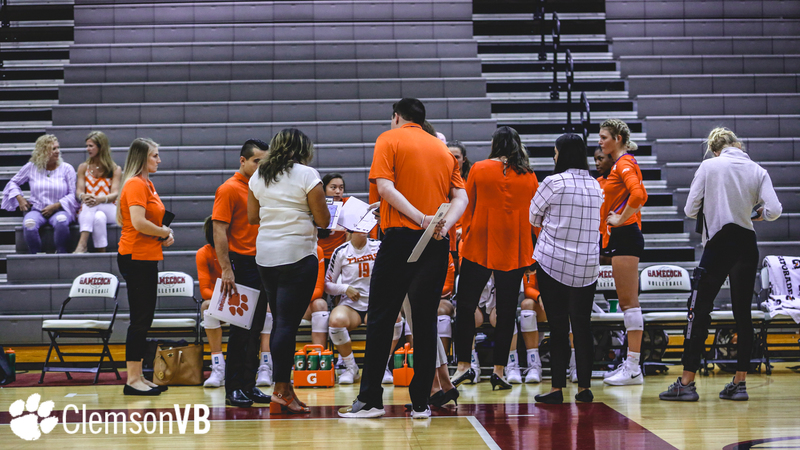 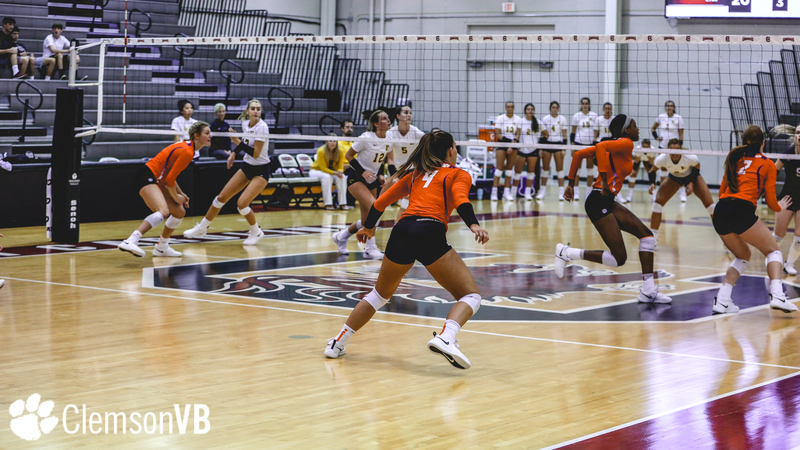 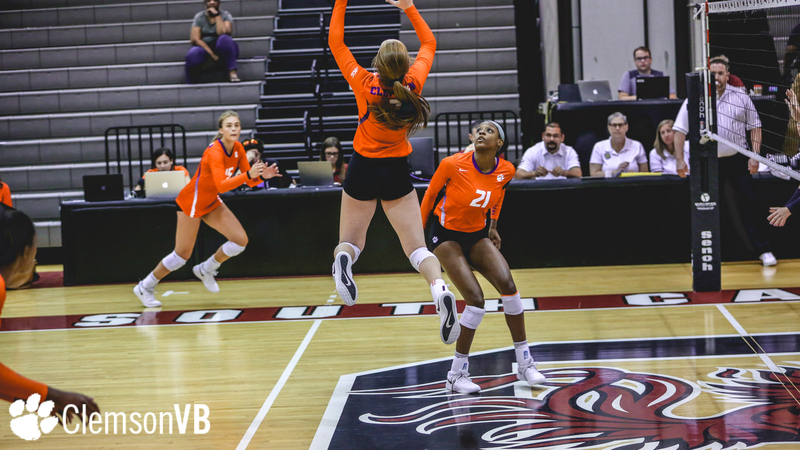 A stout defensive effort by the Tigers, which included 11.0 blocks and 39 digs, helped propel the Tigers to victory in the first-ever matchup against the Islanders. 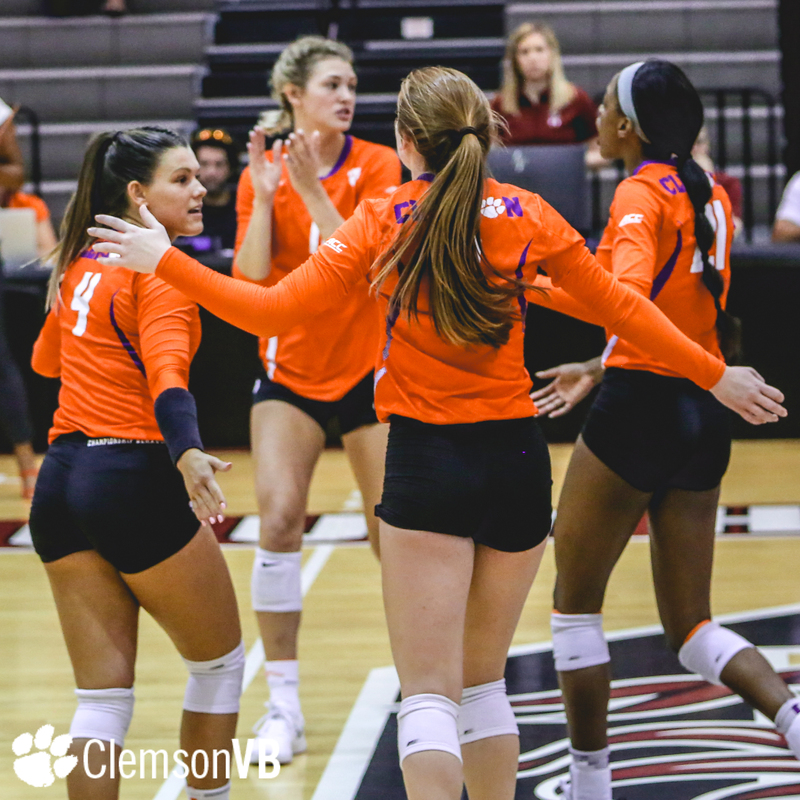 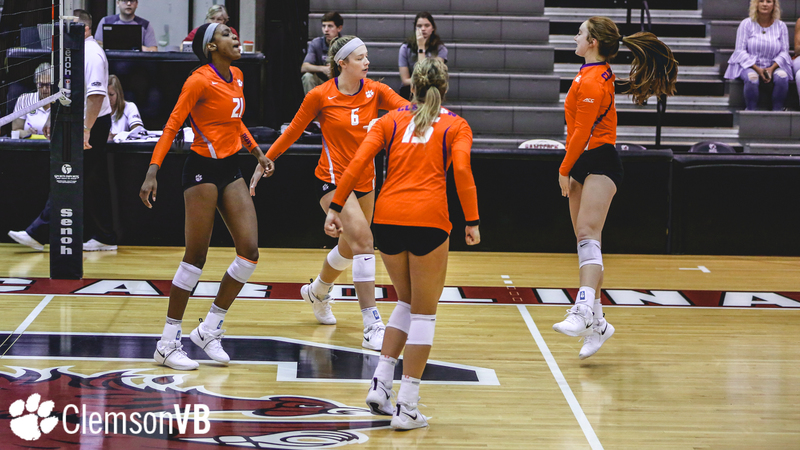 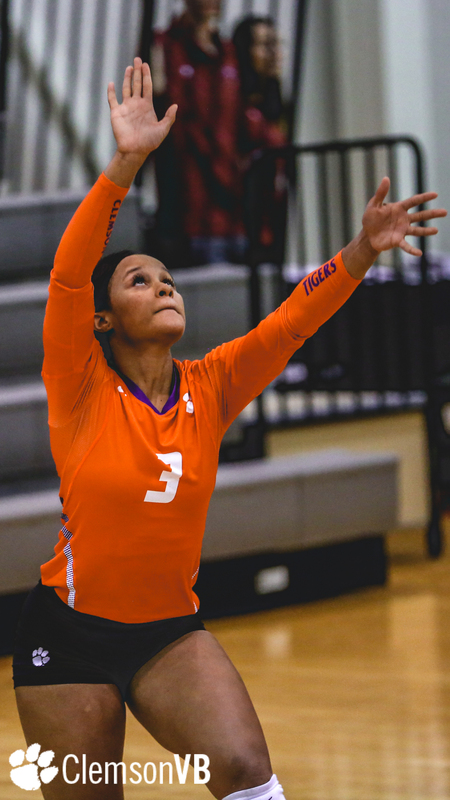 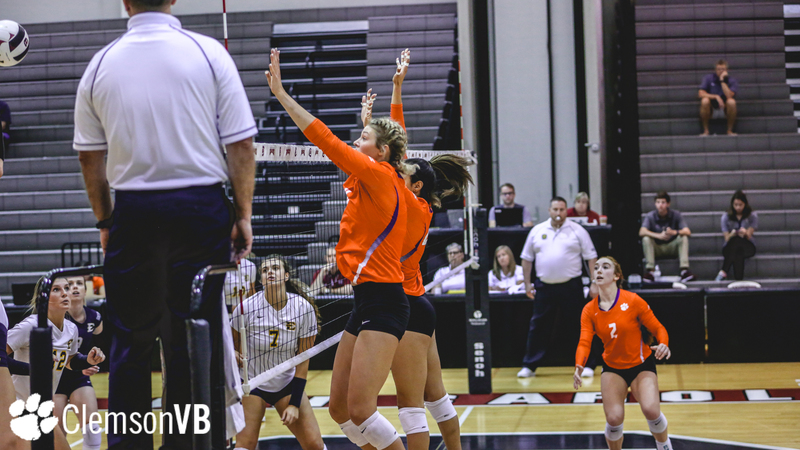 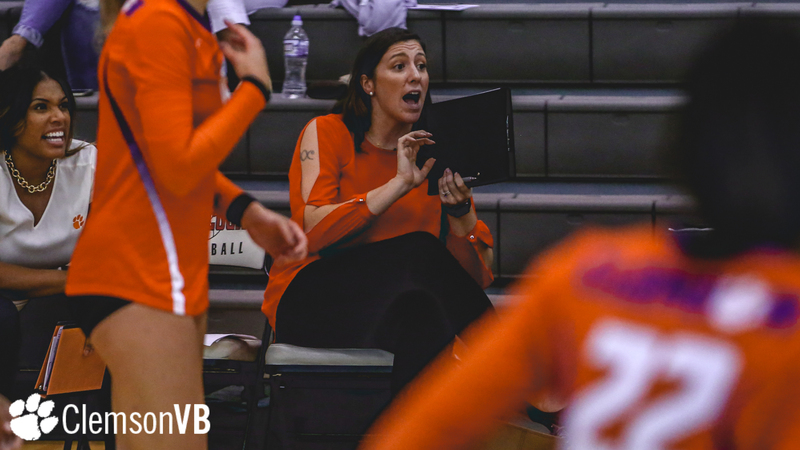 Clemson fell, 3-1 (25-23, 16-25, 25-23, 26-28) against ETSU Friday morning. 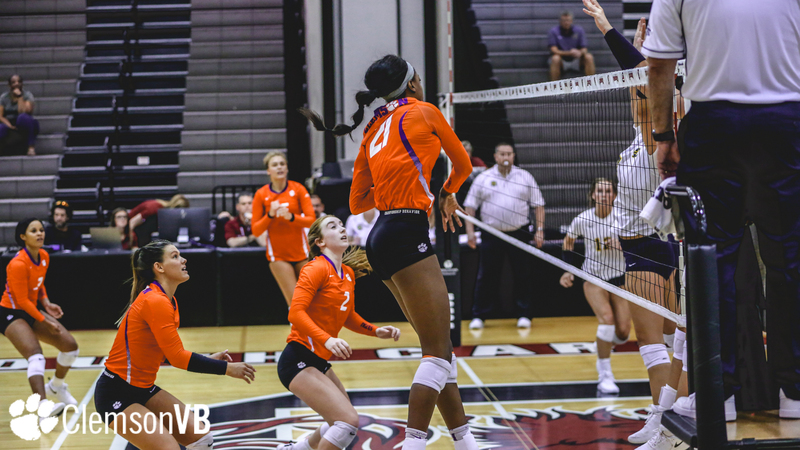 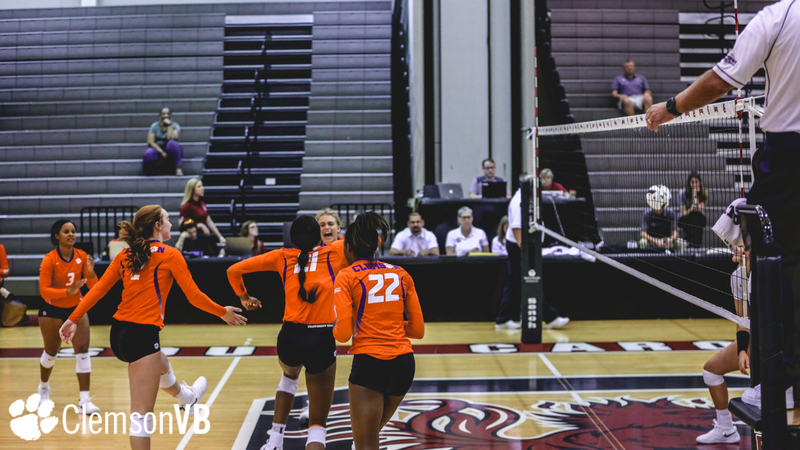 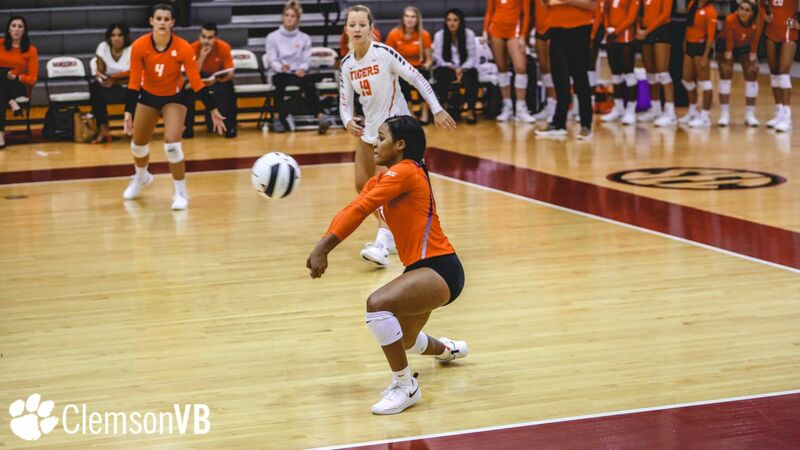 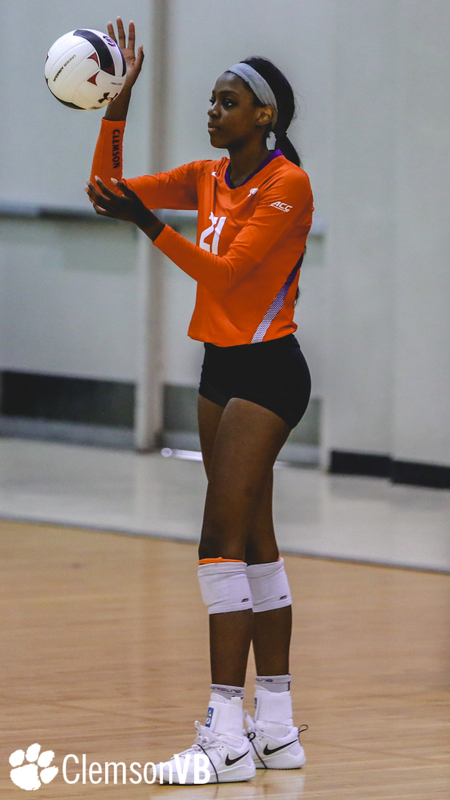 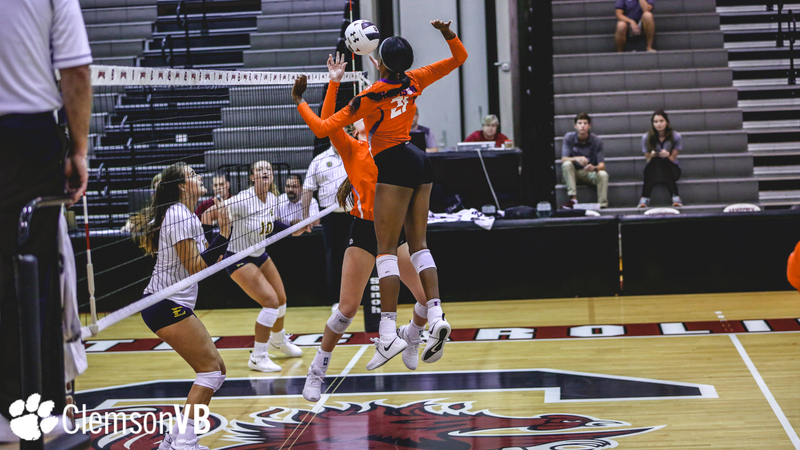 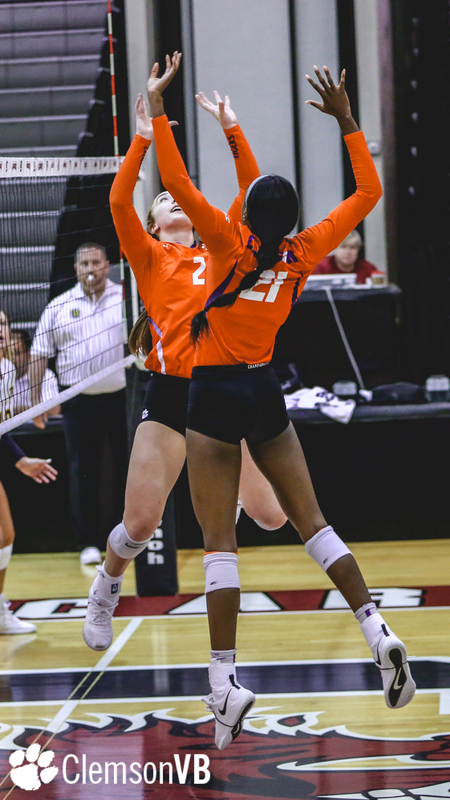 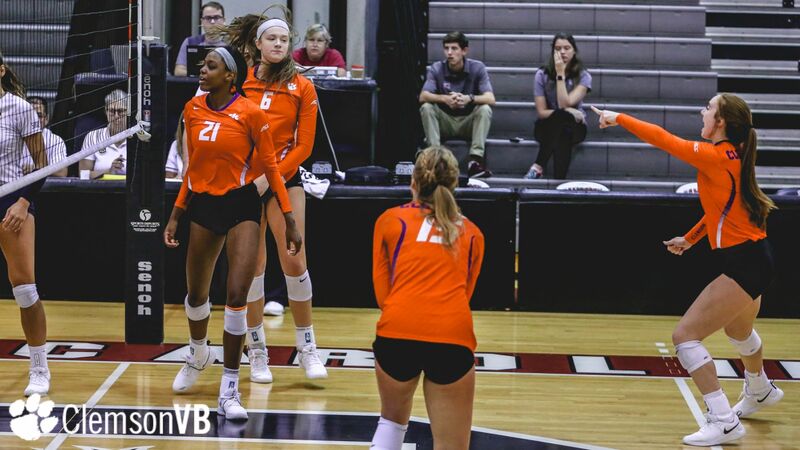 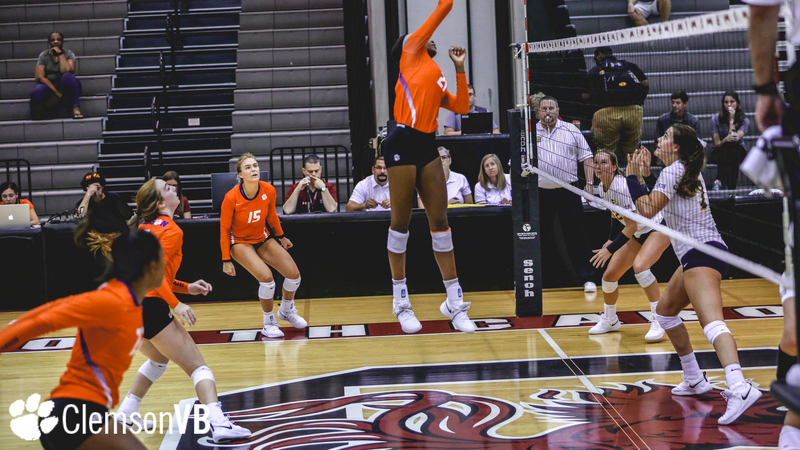 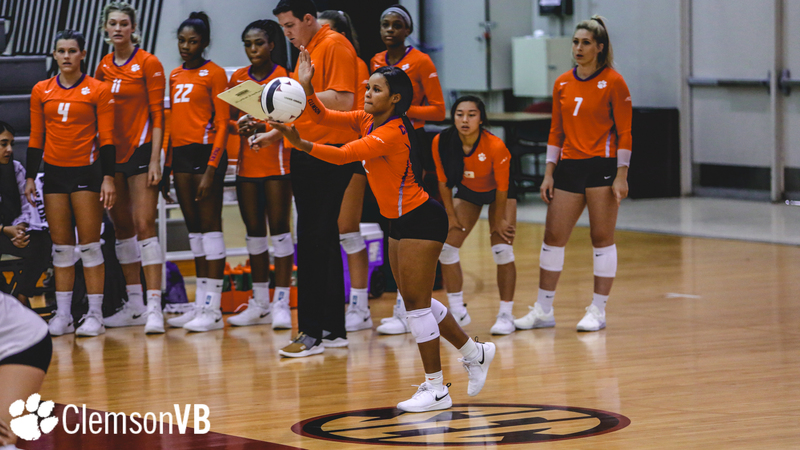 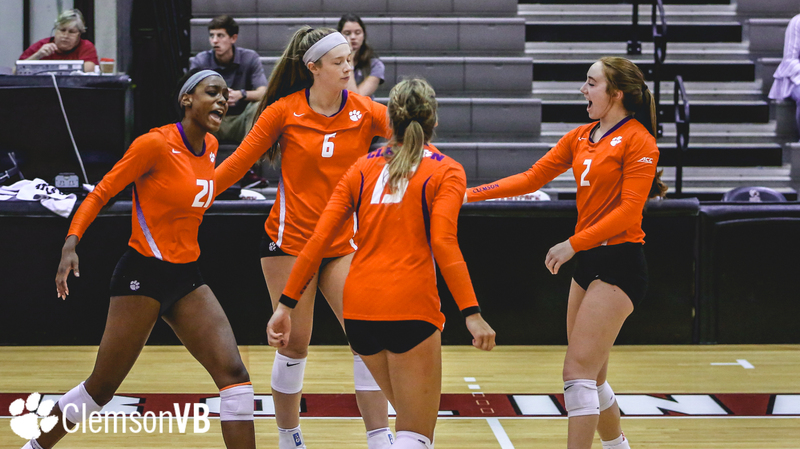 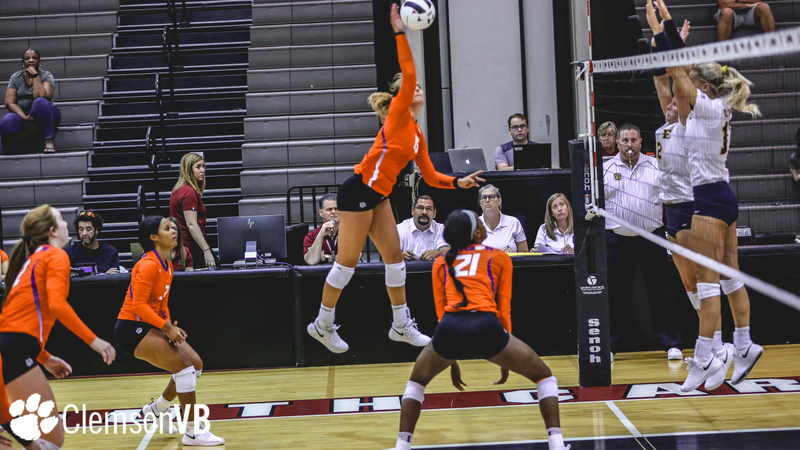 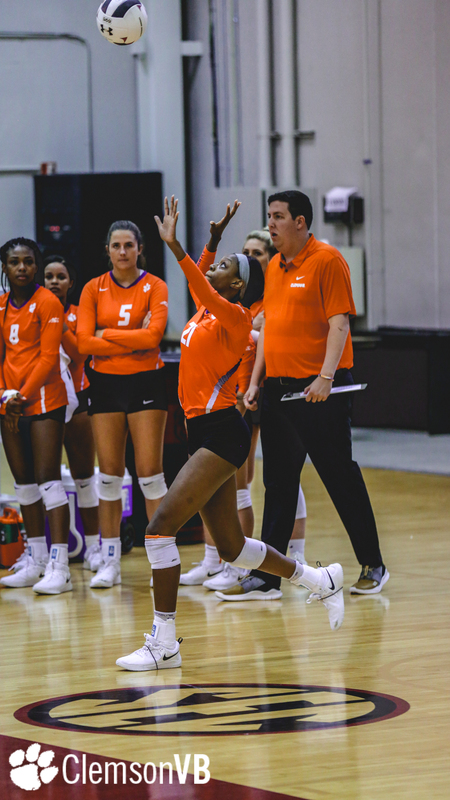 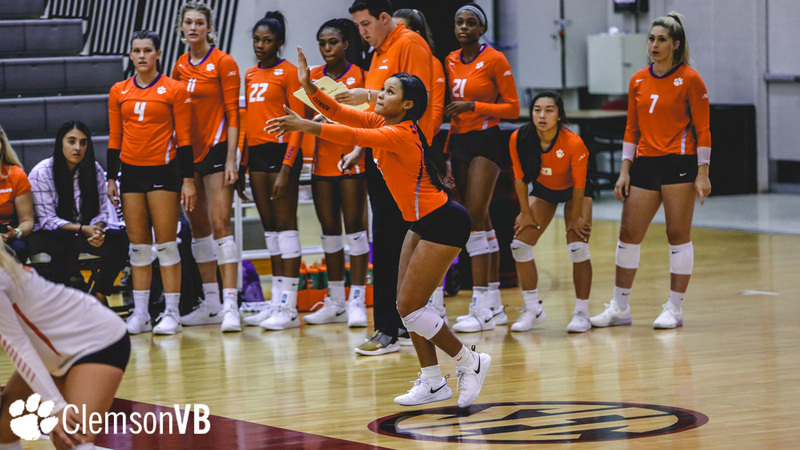 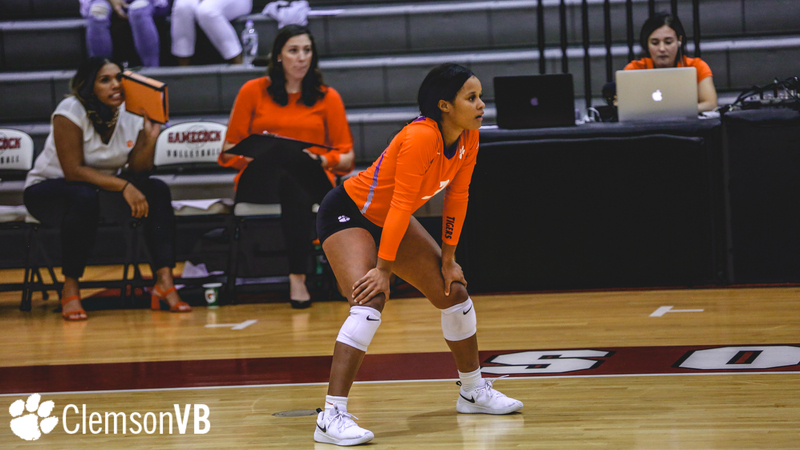 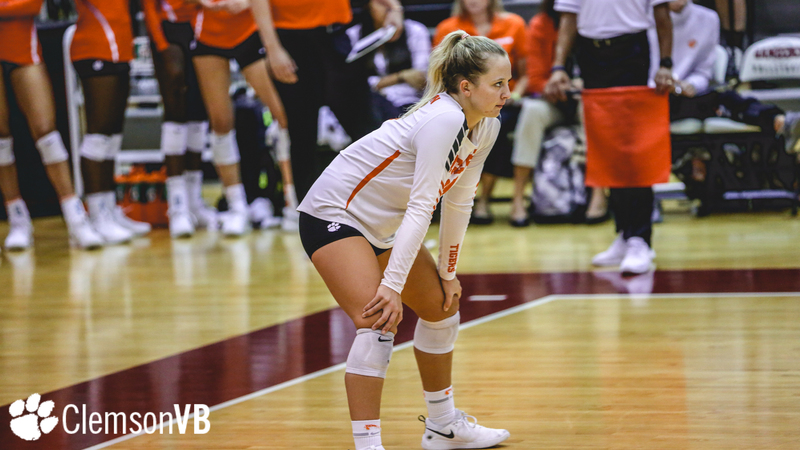 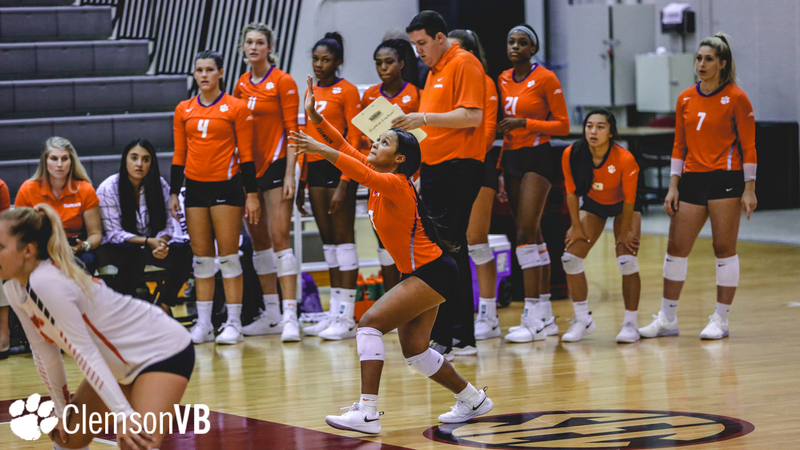 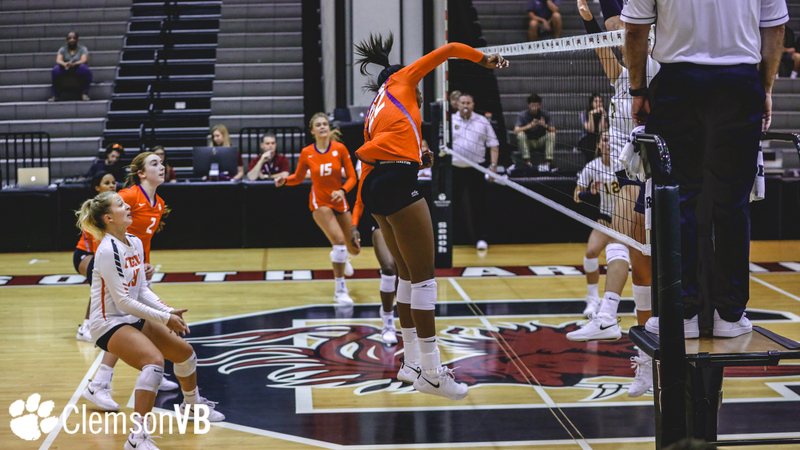 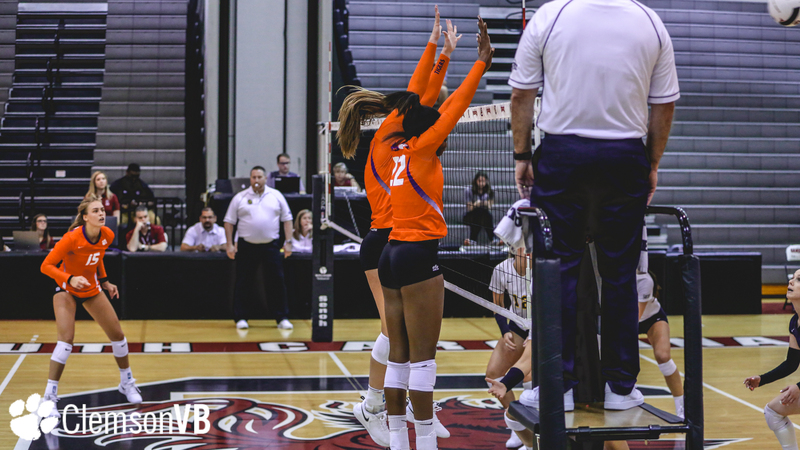 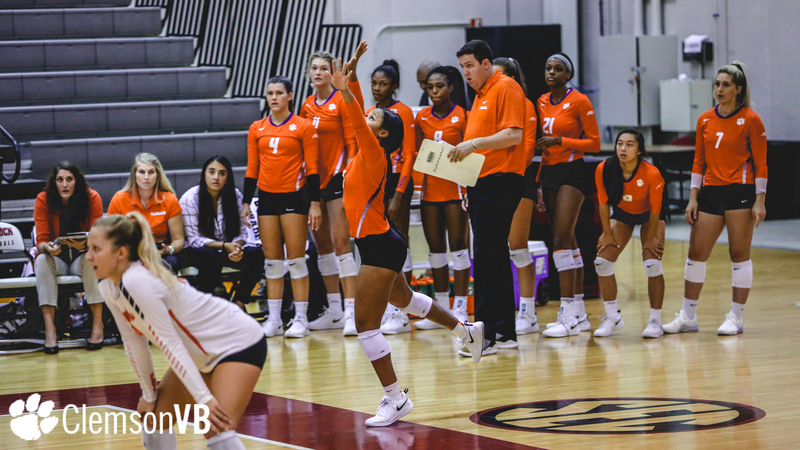 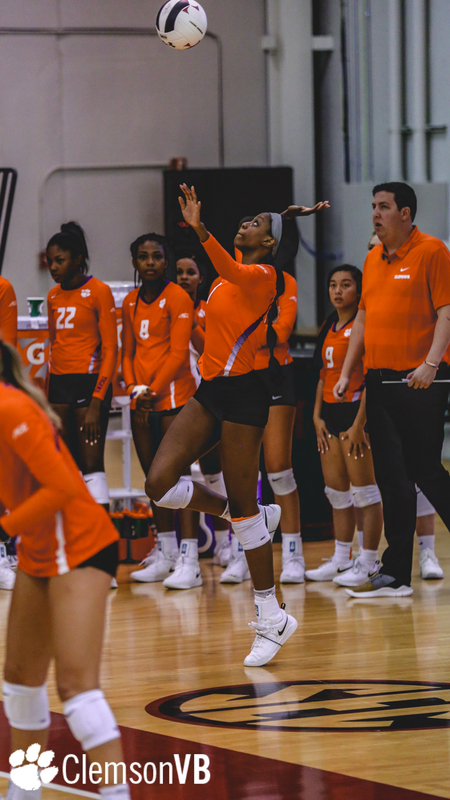 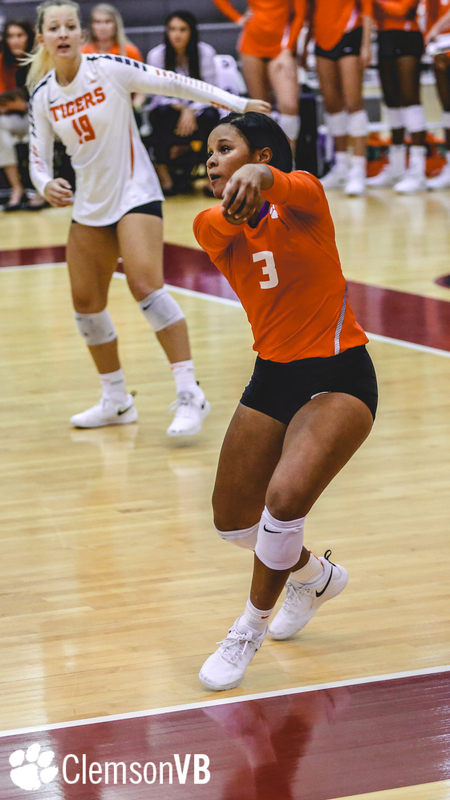 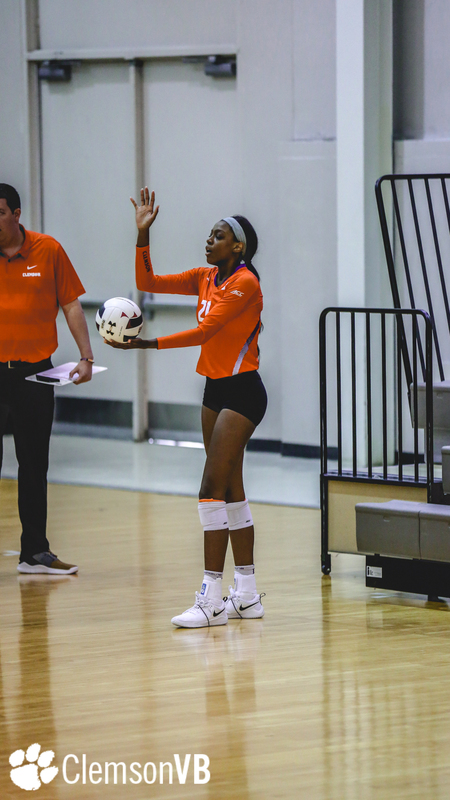 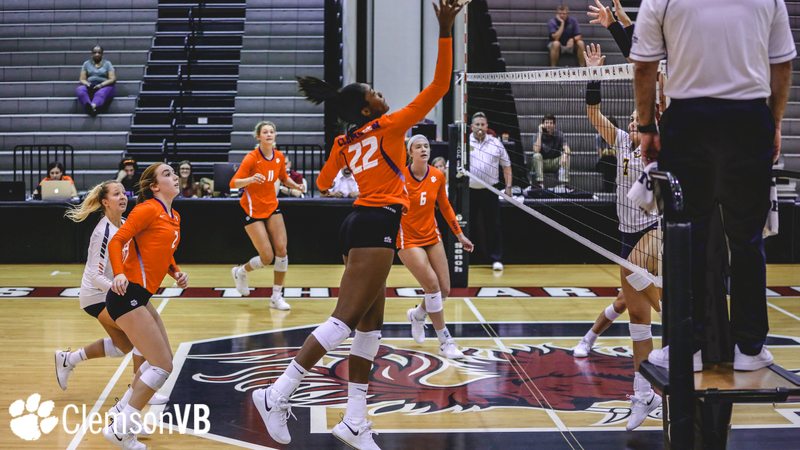 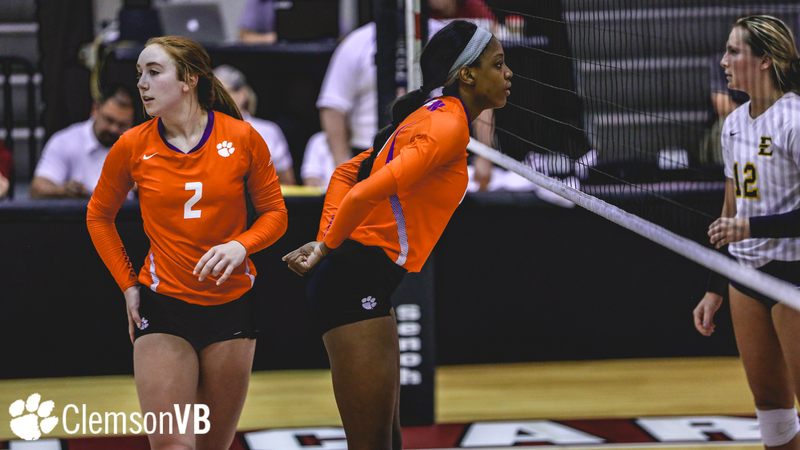 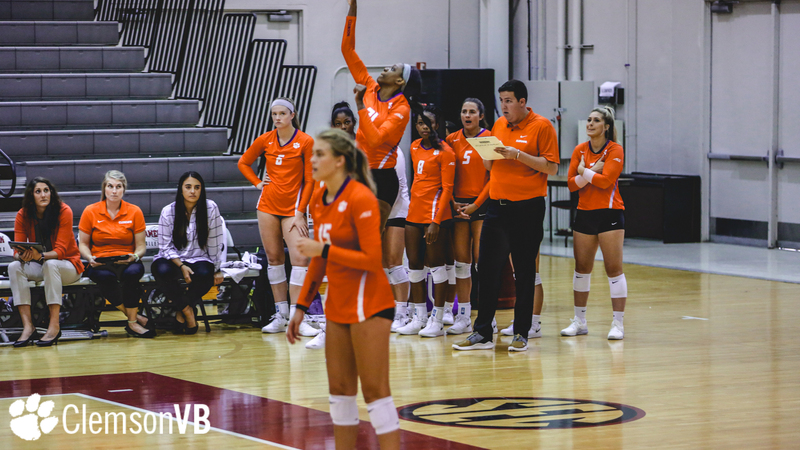 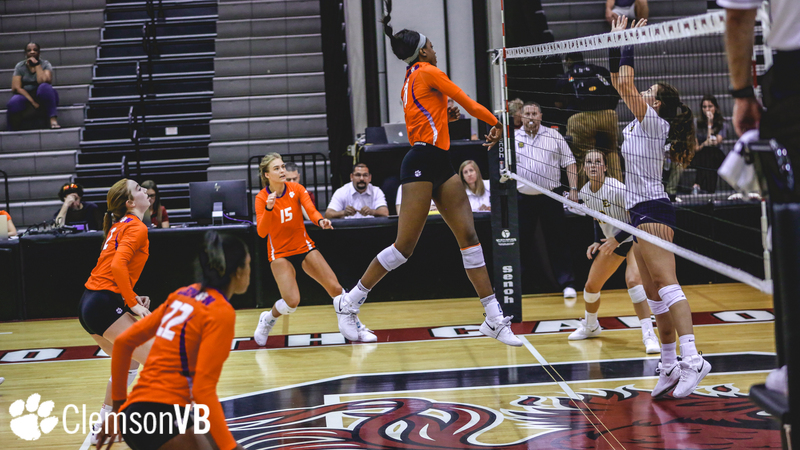 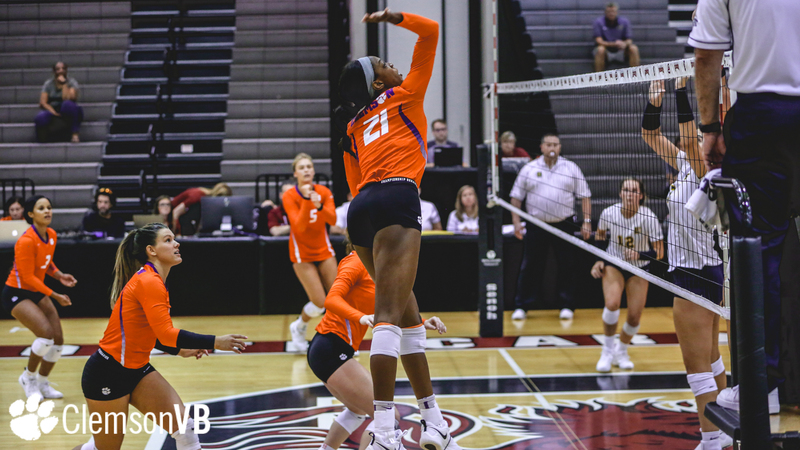 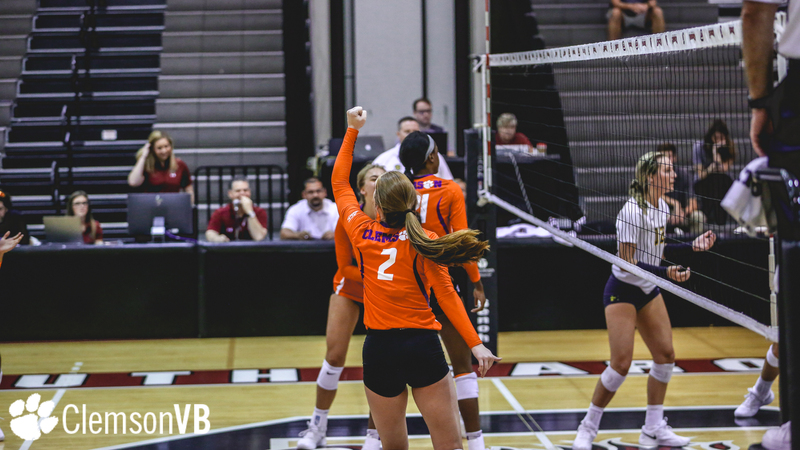 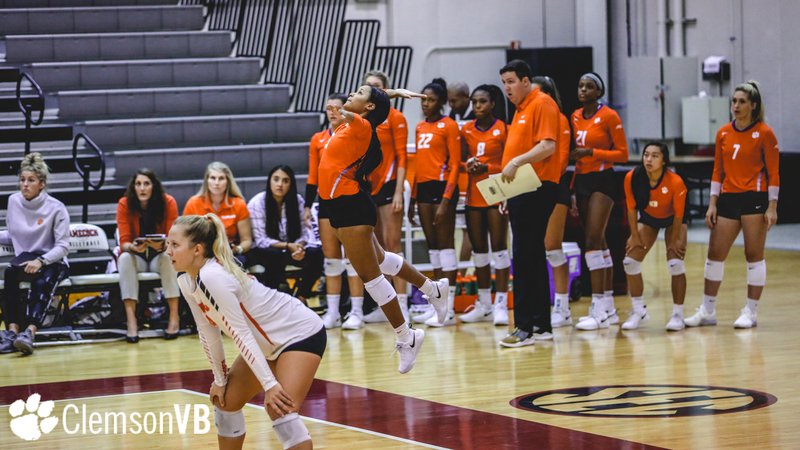 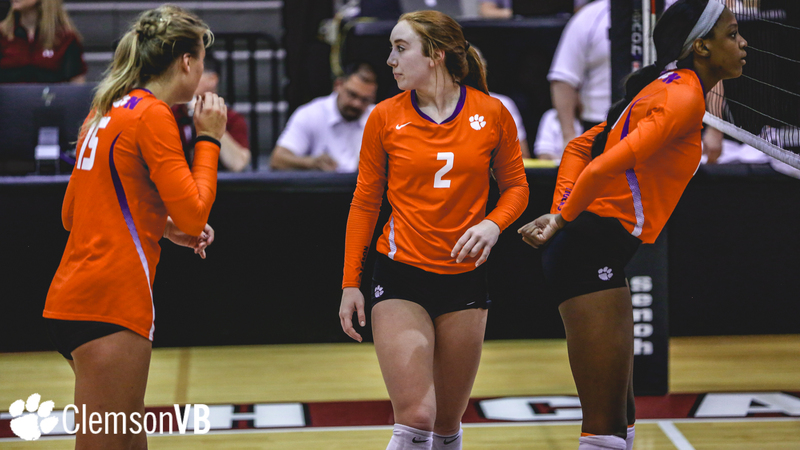 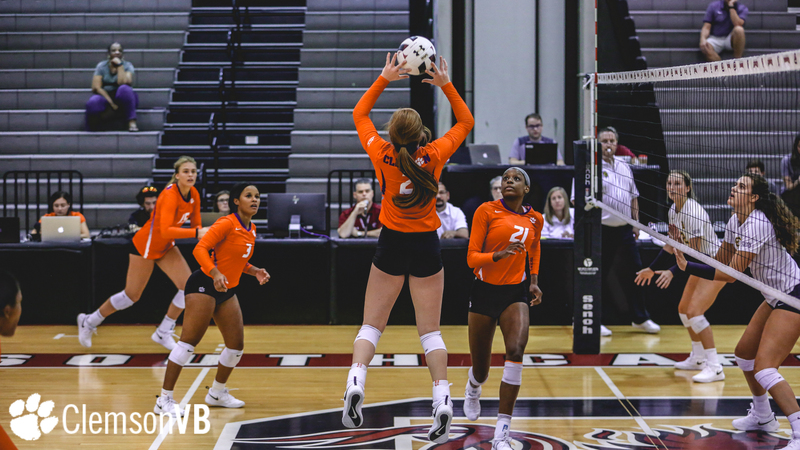 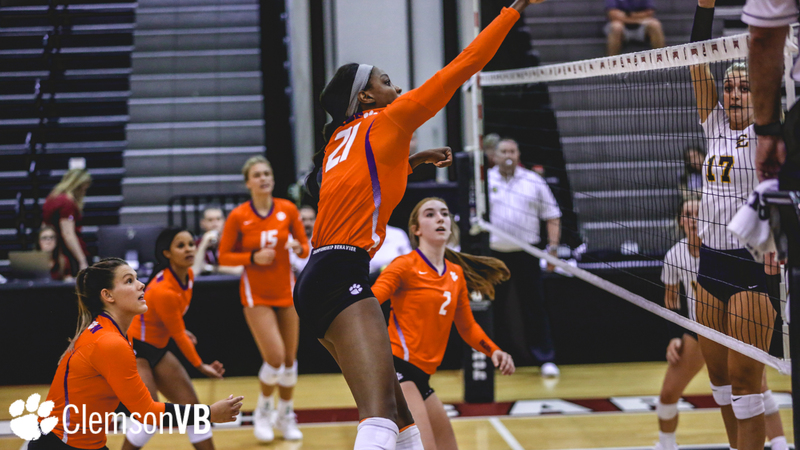 Freshman middle blocker Adria Oliver led the Clemson effort up front with a match-high 13.5 points on 10 kills, five block assists and a service ace. 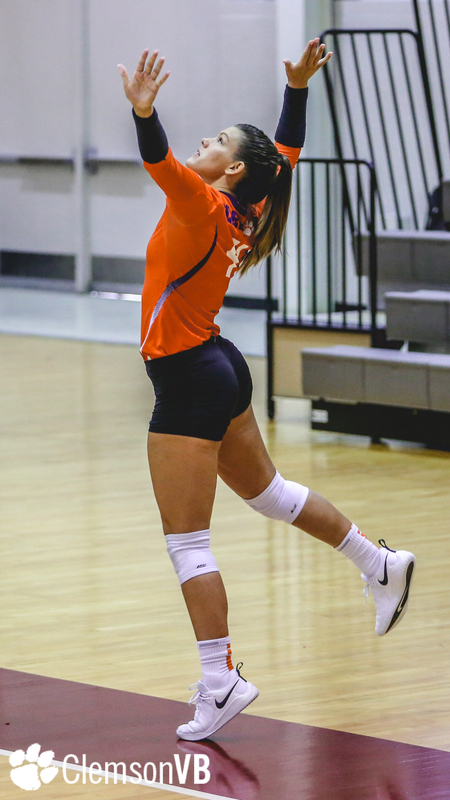 Oliver also hit .500 for the match along with a .625 kill percentage. 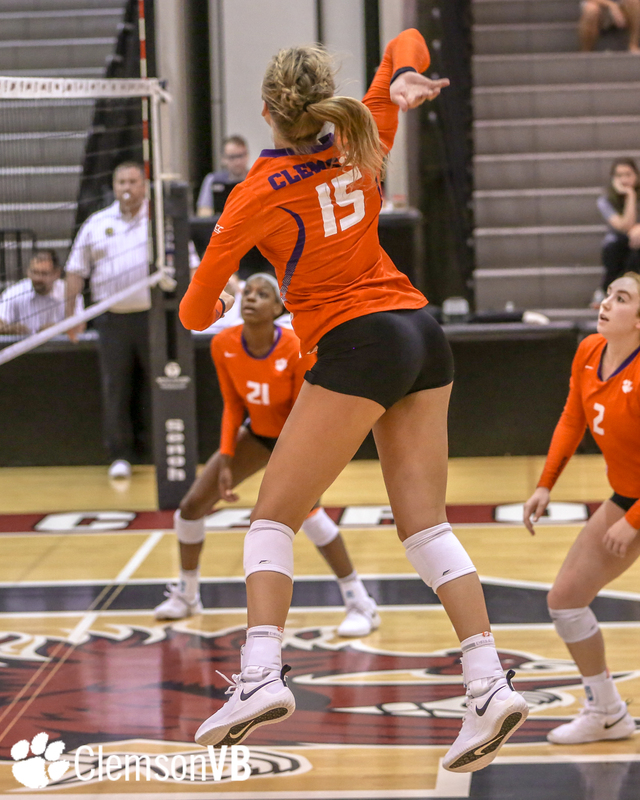 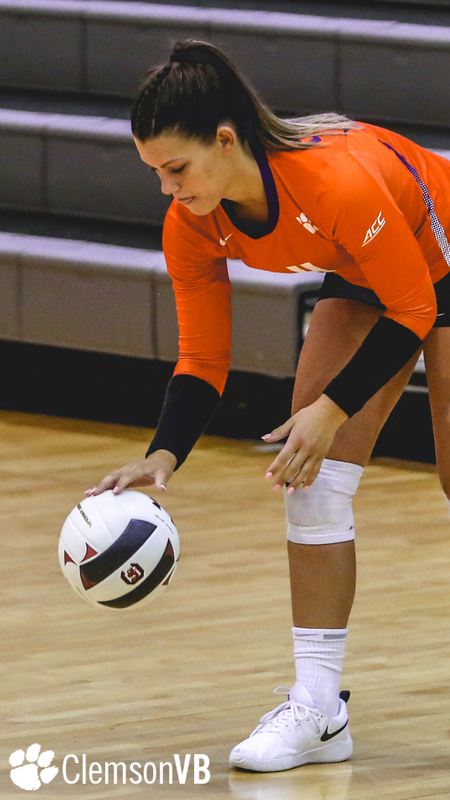 Clemson saw a balanced attack from eight different players who registered at least one kill. 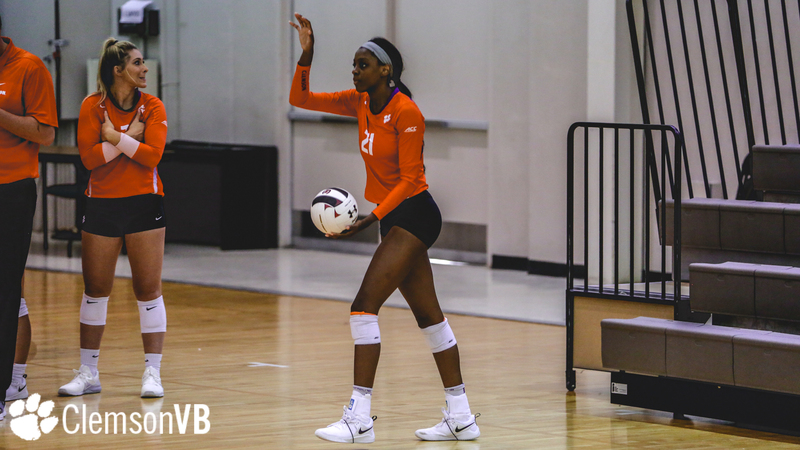 Additionally, freshman setter Gabby Easton chipped in 29 assists. 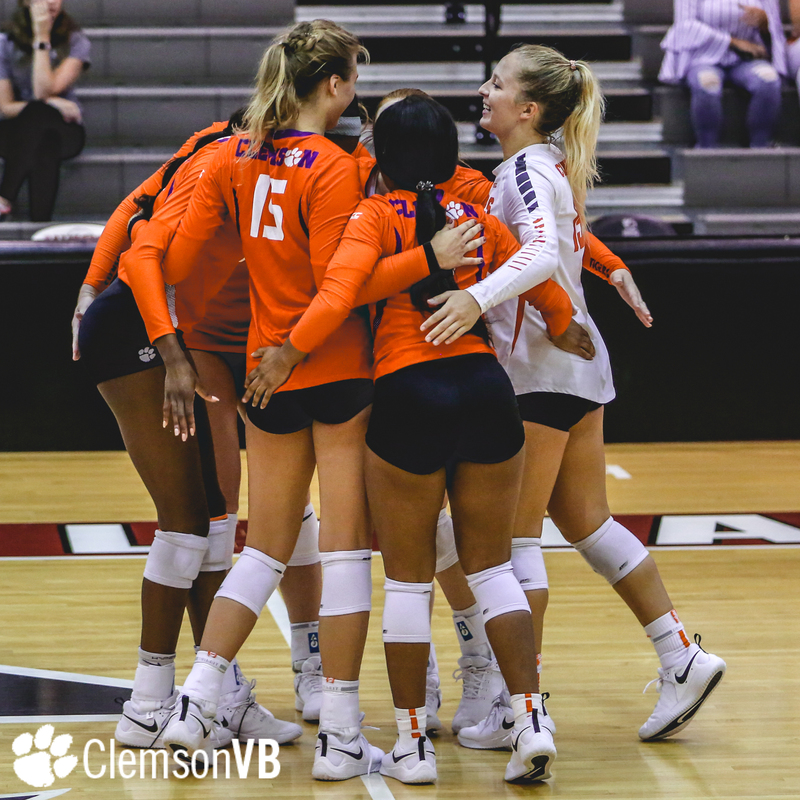 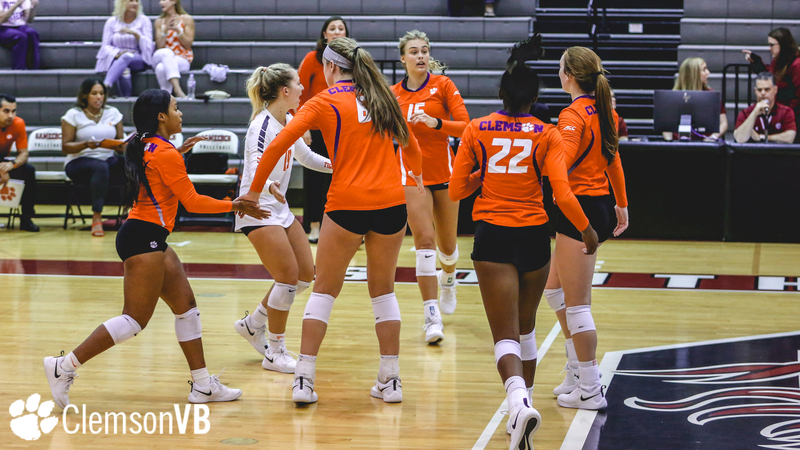 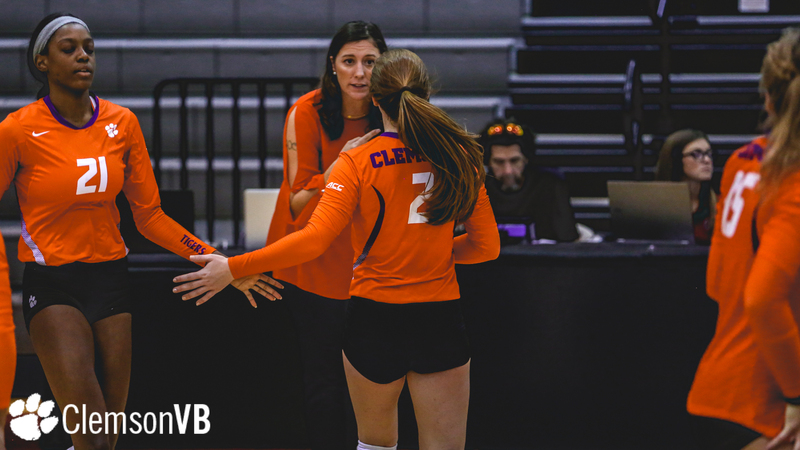 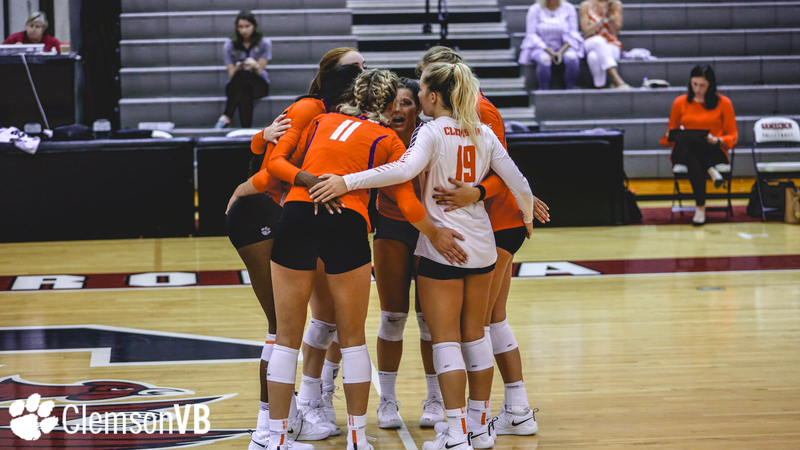 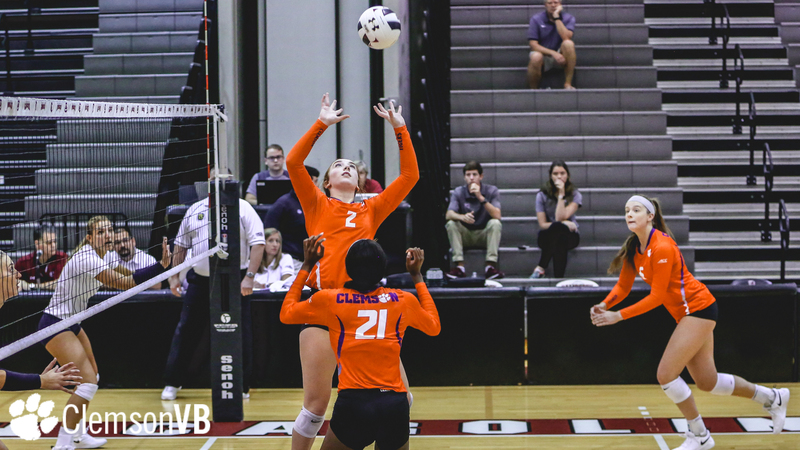 In the opening match against ETSU Friday, Clemson won a tight first set, 25-23, led by Alyssa Deloney, who registered five of her career-best 12 kills. 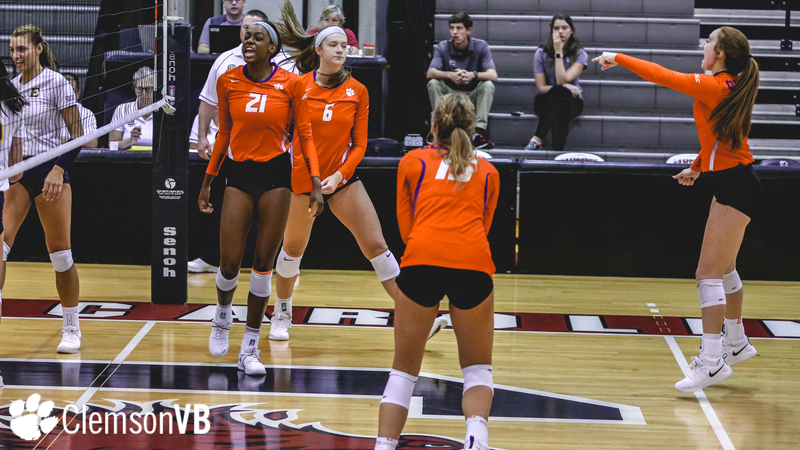 After dropping the second set, 16-25, the Tigers remained neck-and-neck with ETSU throughout set No. 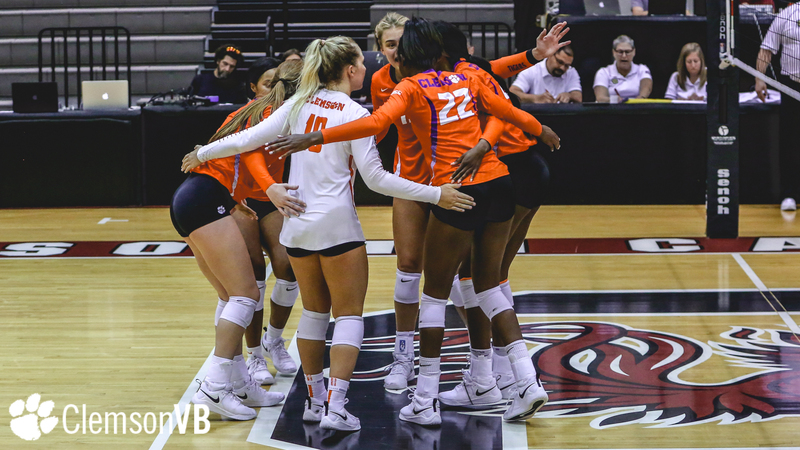 3 as neither team led by more than two points. 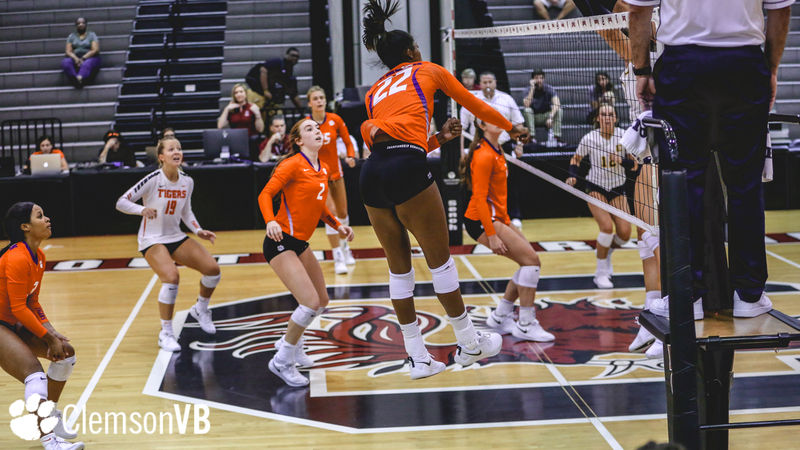 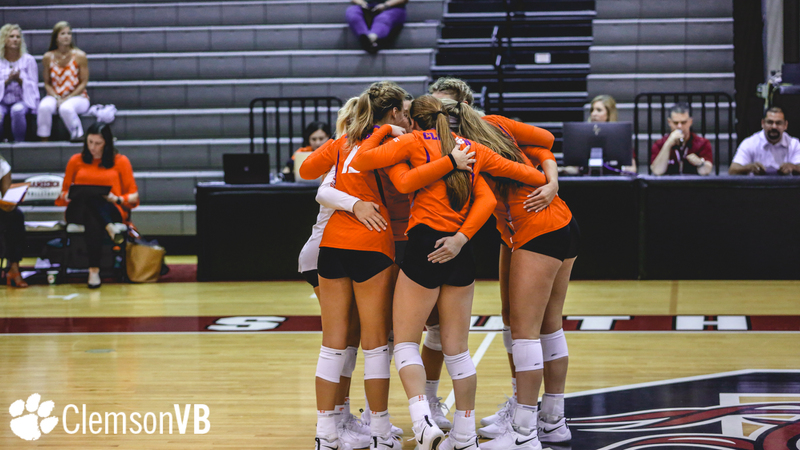 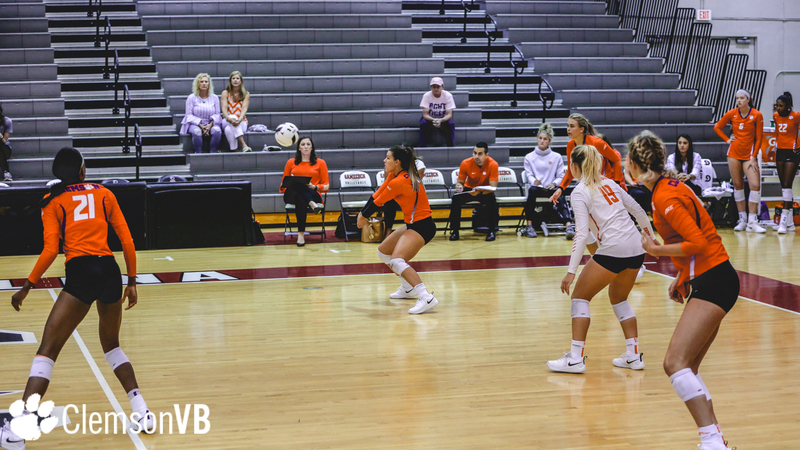 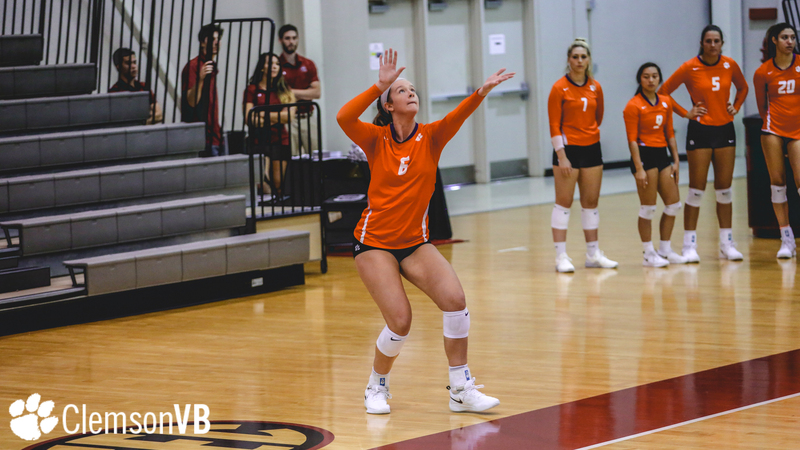 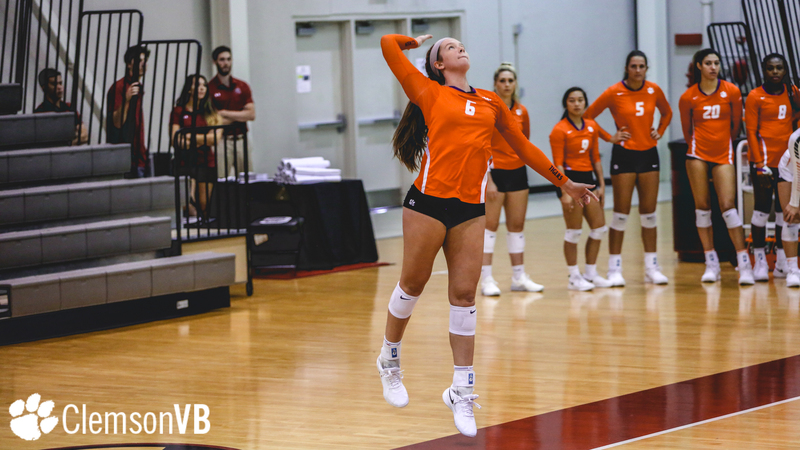 A kill from redshirt sophomore Brooke Bailey late in the third set gave Clemson a 23-22 lead, but the Bucs responded with three straight points to take the game and a 2-1 lead. 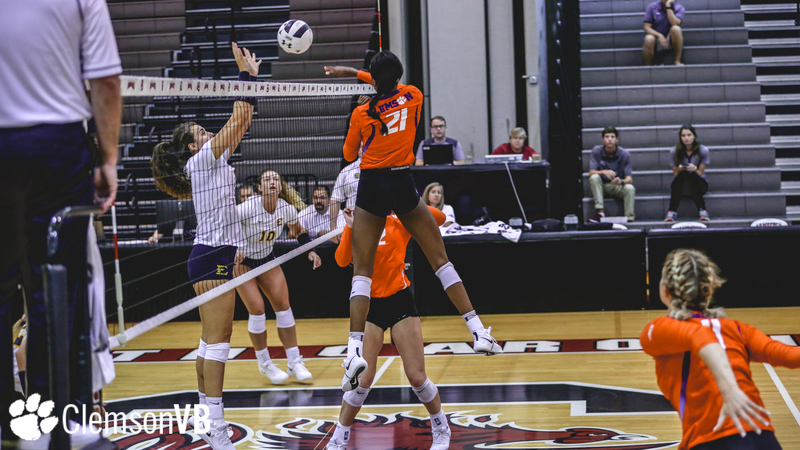 ETSU would close out the fourth set and match in extra points, 28-26, despite seven Bailey kills in the final set. 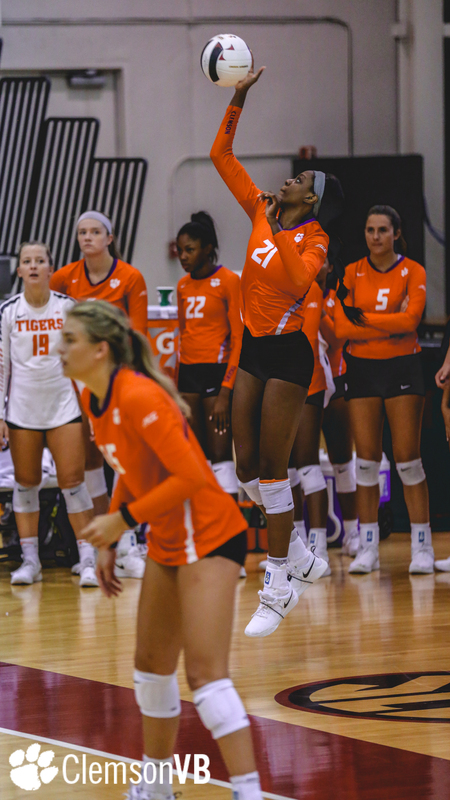 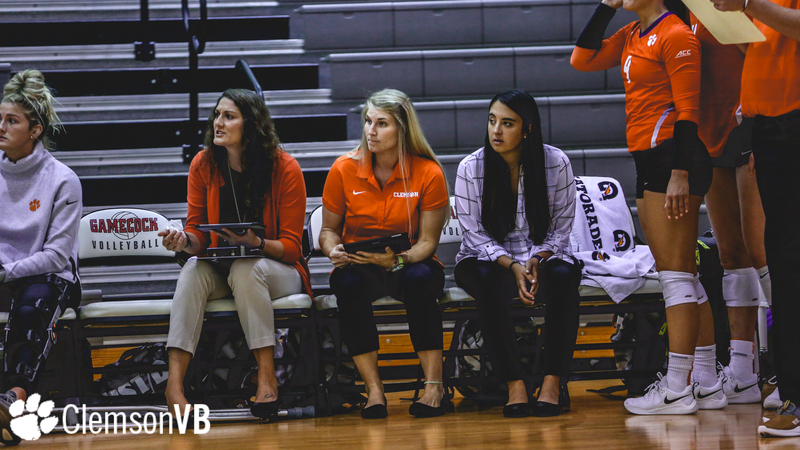 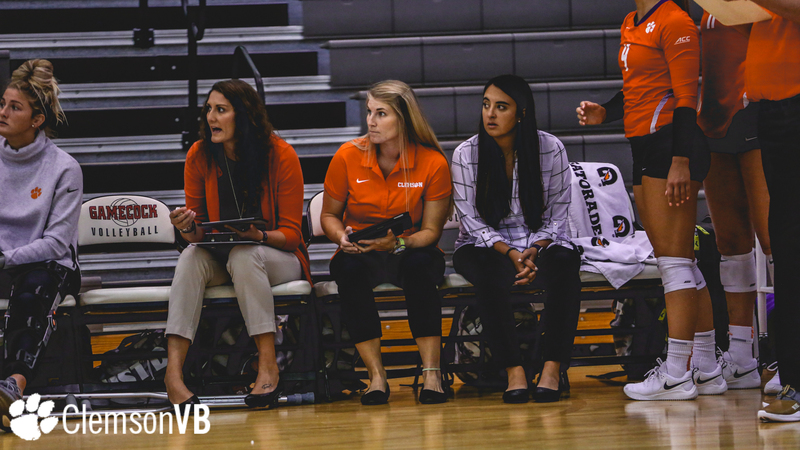 Texas A&M Corpus Christi match notes: Clemson recorded 11.0 blocks in just three sets, a first since the Tigers’ 3-0 win over Presbyterian Sept. 11, 2015 … Adria Oliver’s 10 kills mark the second straight match in which a Clemson freshman has recorded double-digit kills (Alberts’ 10 vs. ETSU) … Clemson’s hitting percentage of .286 is the best since its 3-1 win over Georgia Southern Sept. 16, 2017 … The Tigers achieved a sideout percentage of 65% for the match, while holding the Islanders to 37 percent … Freshmen Crystal Childs and Katelyn DeGuzman made their Clemson debuts. 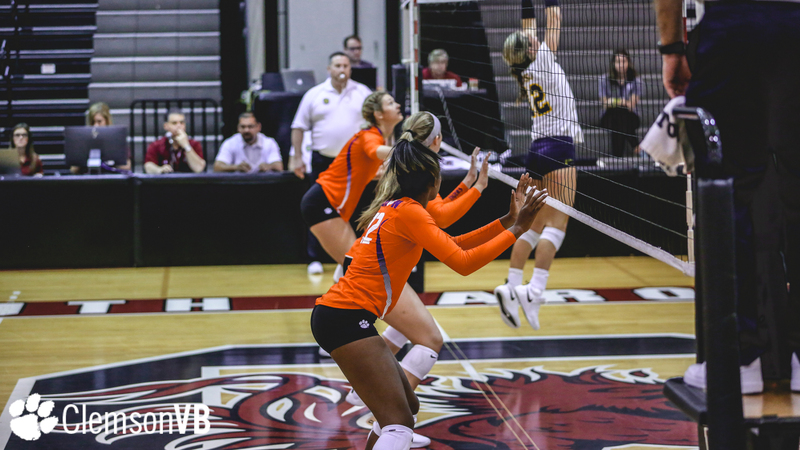 ETSU match notes: Sophomore libero Madi Howell tallied 19 digs to tie her career high for the second time … Freshman setter Gabby Easton dimed 48 assists … Freshman Ashtynne Alberts posted a team-best 15 kills on 46 attacks … Sophomore Alyssa Deloney reached her career high with 12 kills … Deloney hit .241 for the match … Redshirt sophomore Brooke Bailey registered 13 kills while hitting .265 … Seven newcomers: Gabby Easton, Torie Frederick, Ashtynne Alberts, Ava Pritchard, Adria Oliver, Brooke Bailey and Solei Thomas made their Clemson debuts … Freshman Adria Oliver tied the match high with 5.0 blocks – also a team best. 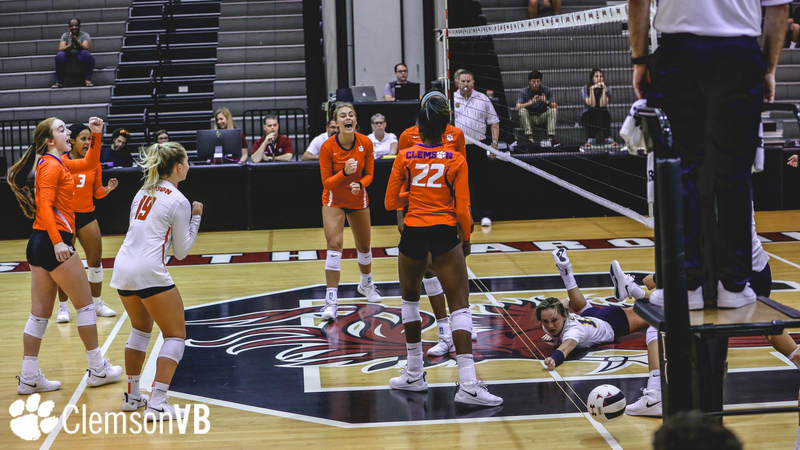 When: Saturday, Aug. 25, 3 p.m.